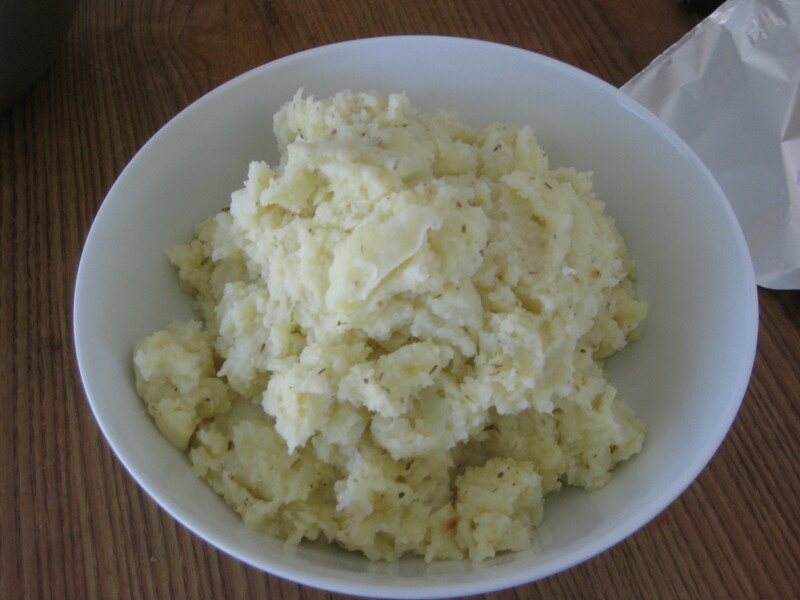 I just adore having mashed potatoes at any time of the year, but it’s especially the best during the holidays. 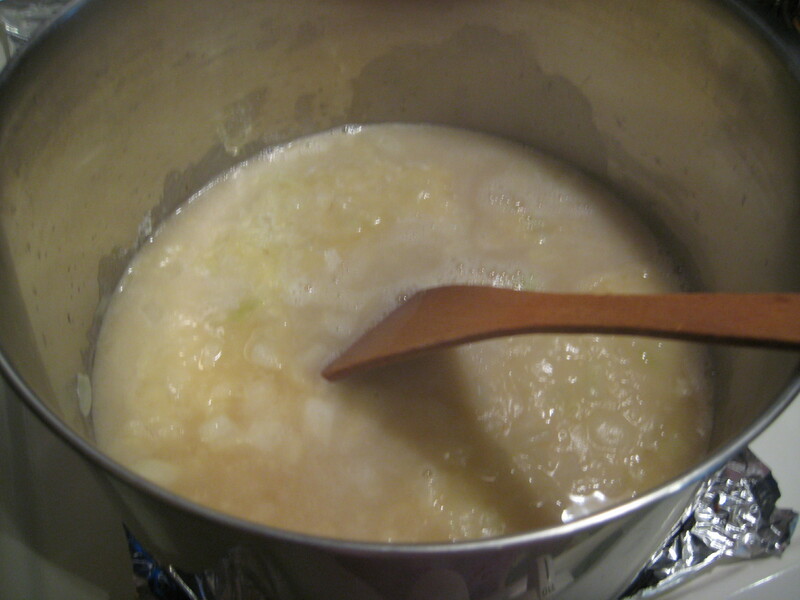 Making it was a pain and I just didn’t like making it, but only during the holidays will I be willing enough to make it. 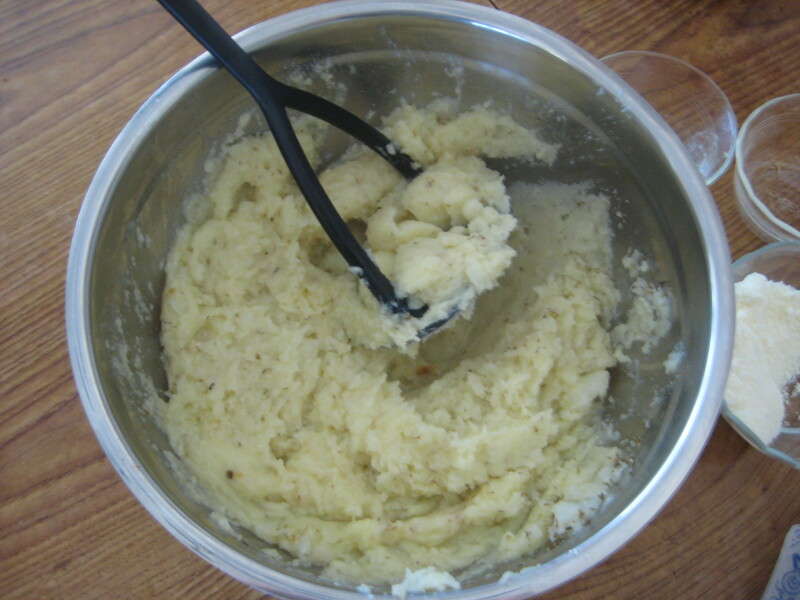 Last year I had made garlic mashed potatoes. 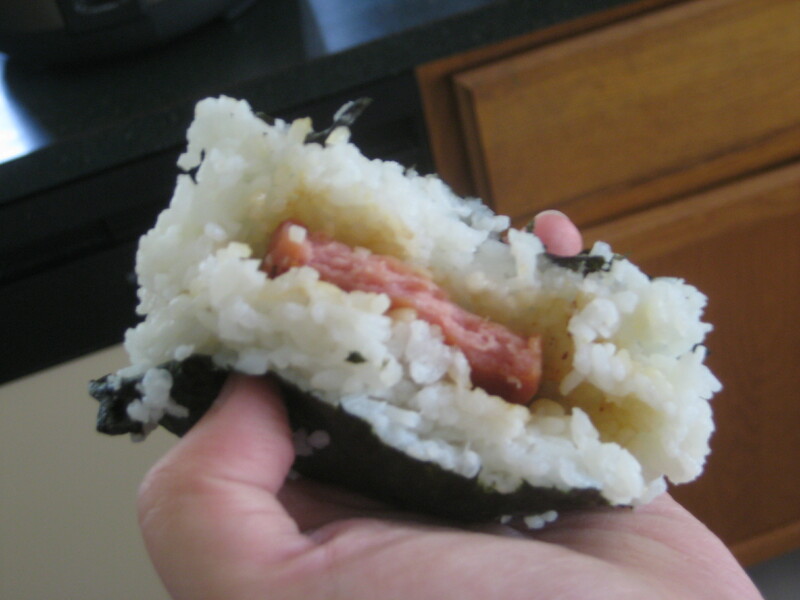 They didn’t turn out as creamy as I had hoped. 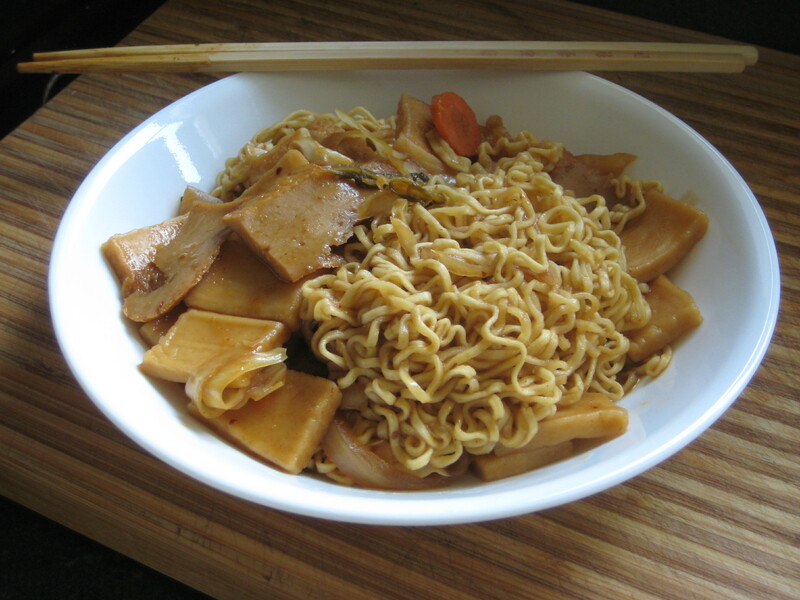 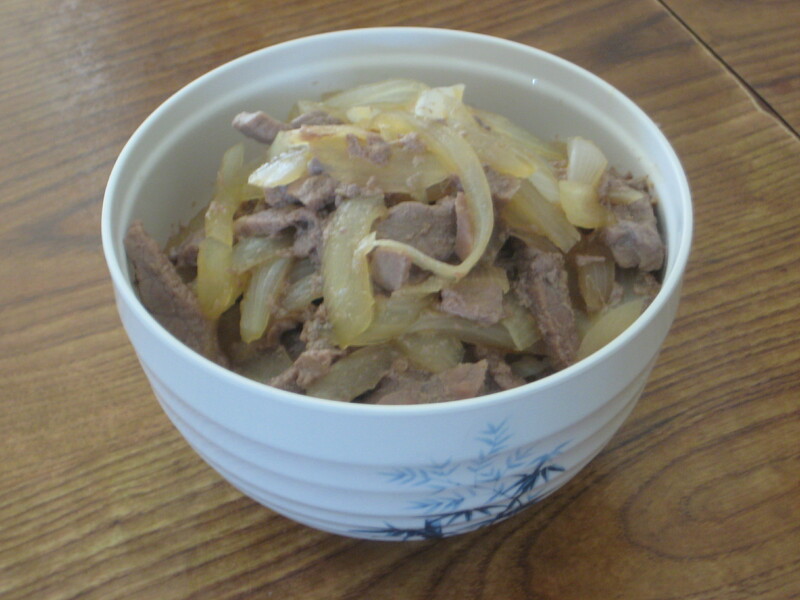 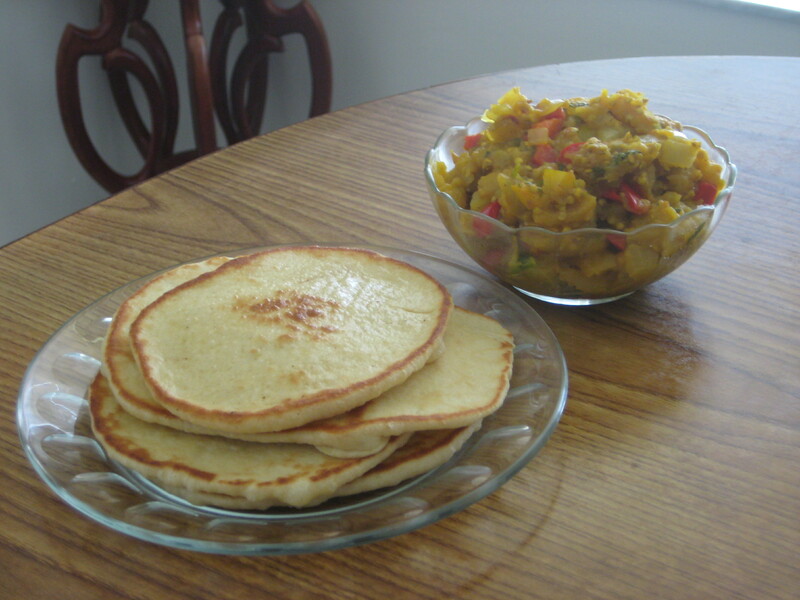 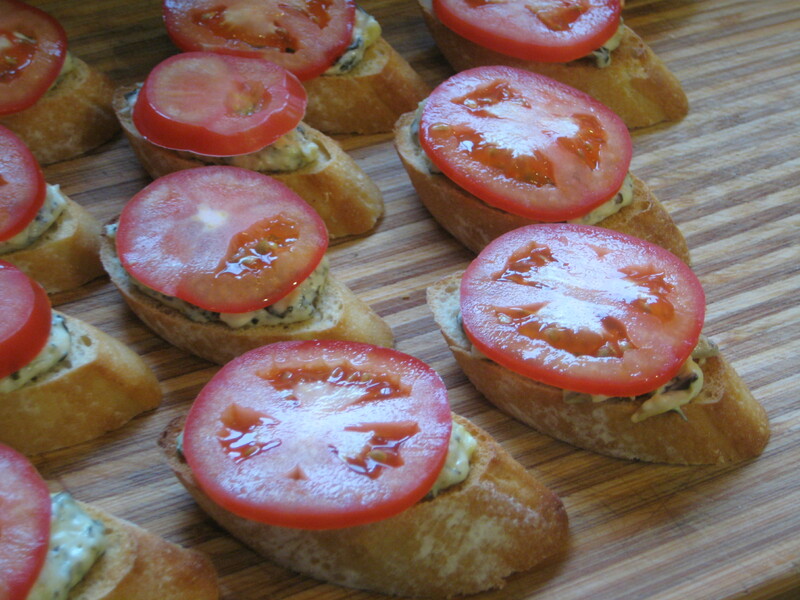 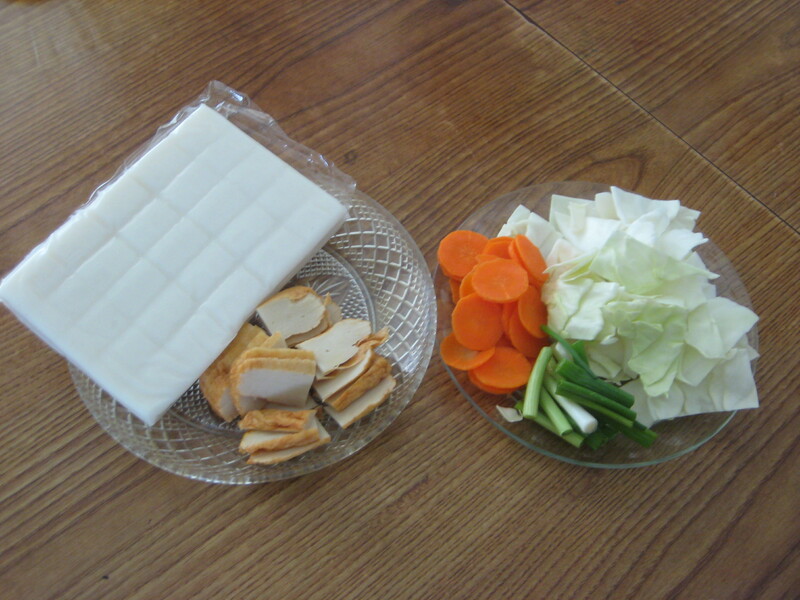 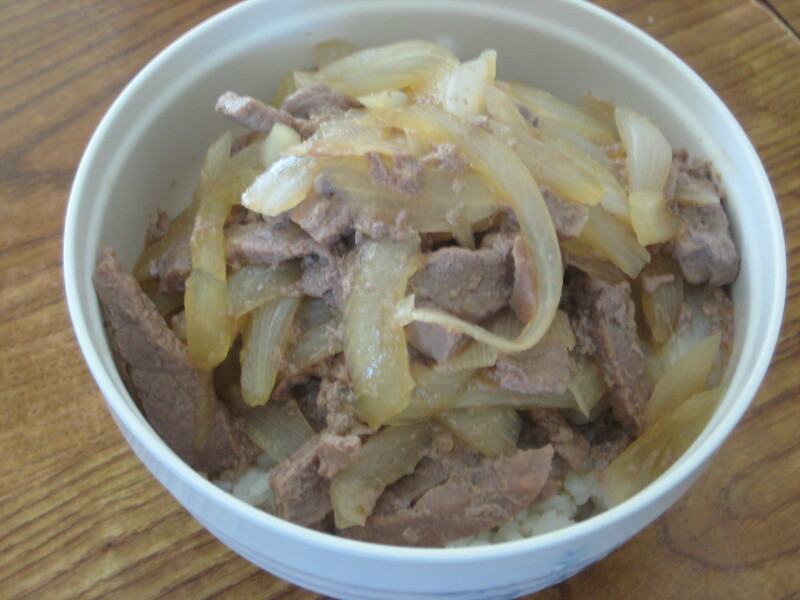 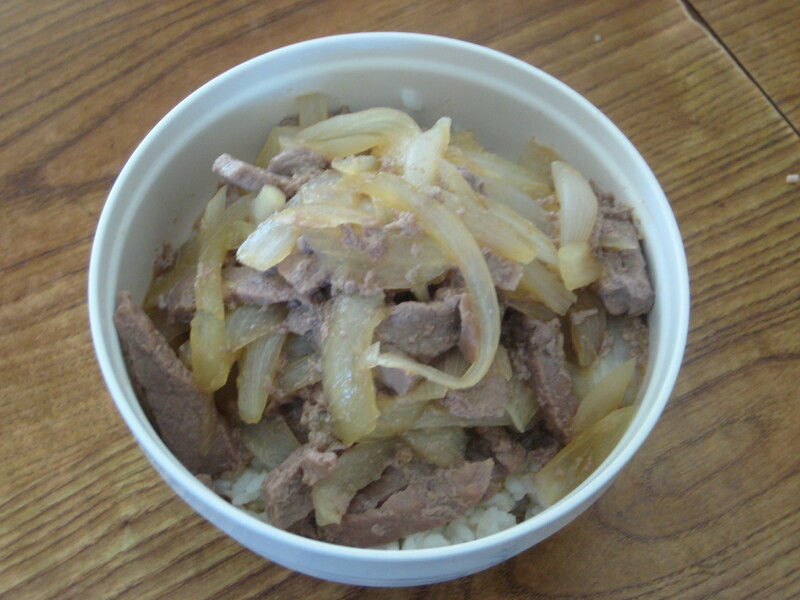 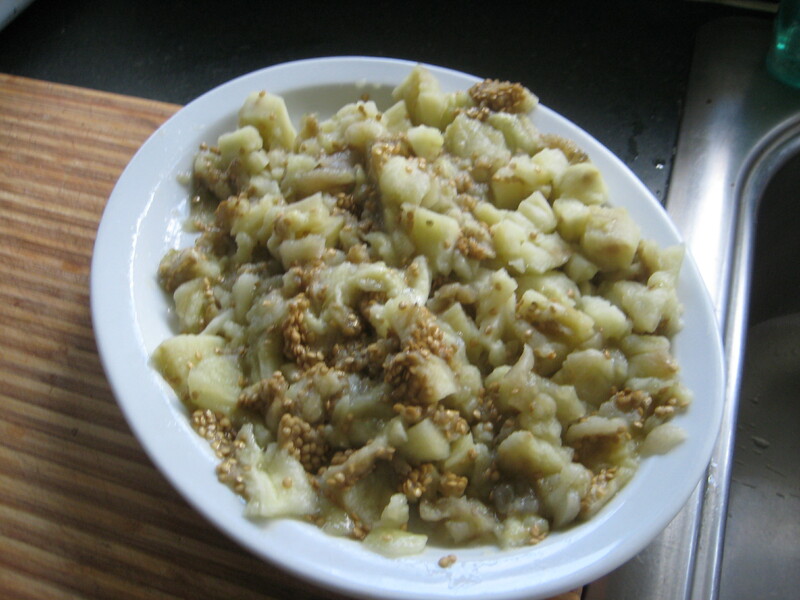 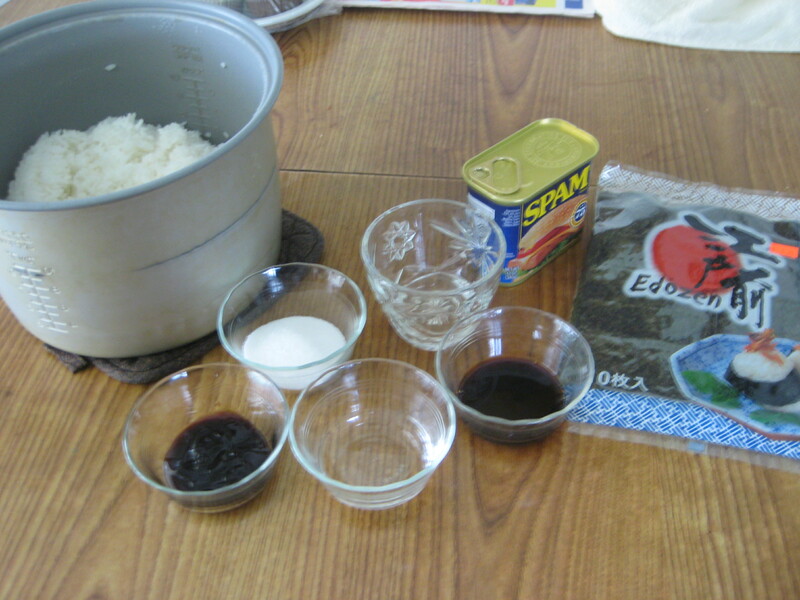 This year I have revised this past recipe and I am going to try it out today. 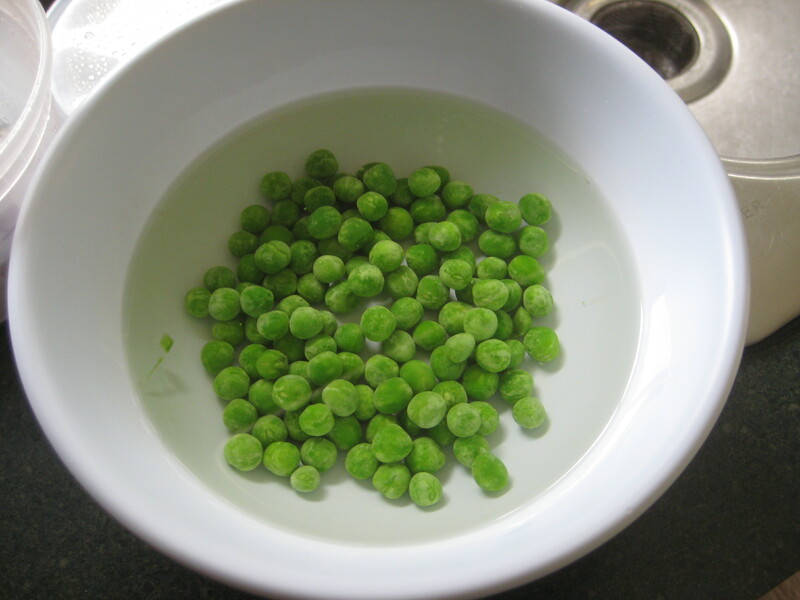 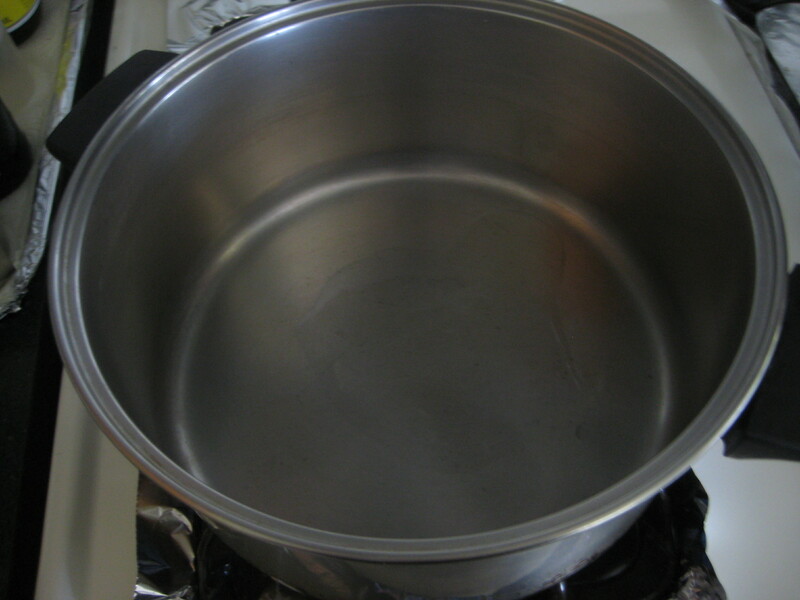 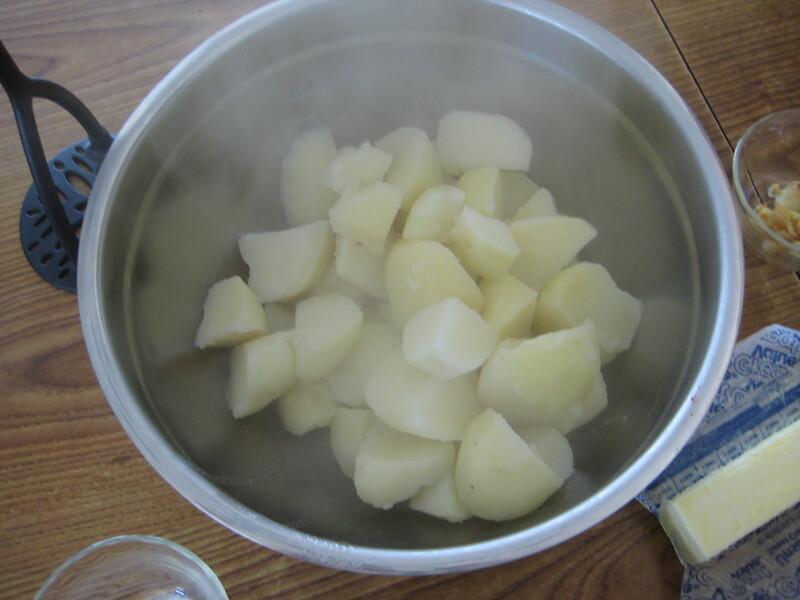 Step 1: In a large pot, have water boiling with a dash of salt. 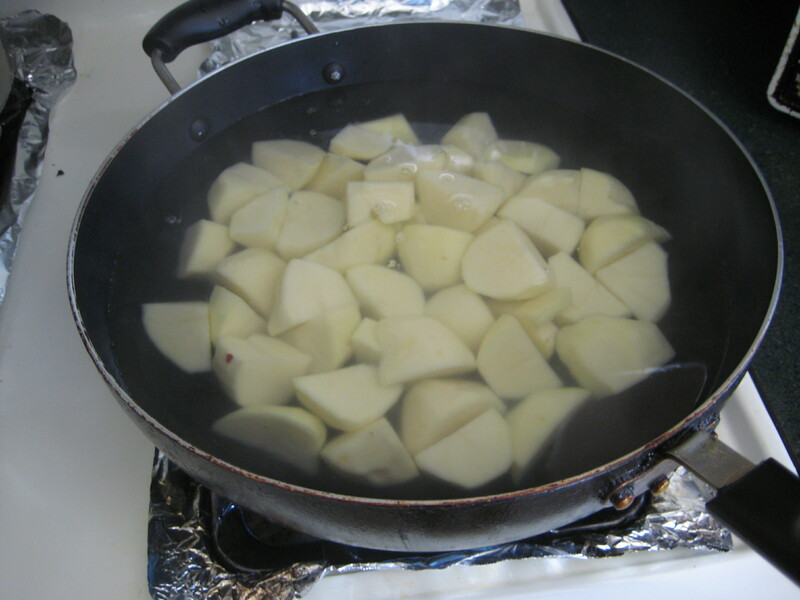 Step 2: Add the potatoes to the pot and boil for 20-25 minutes, or until fork tender. 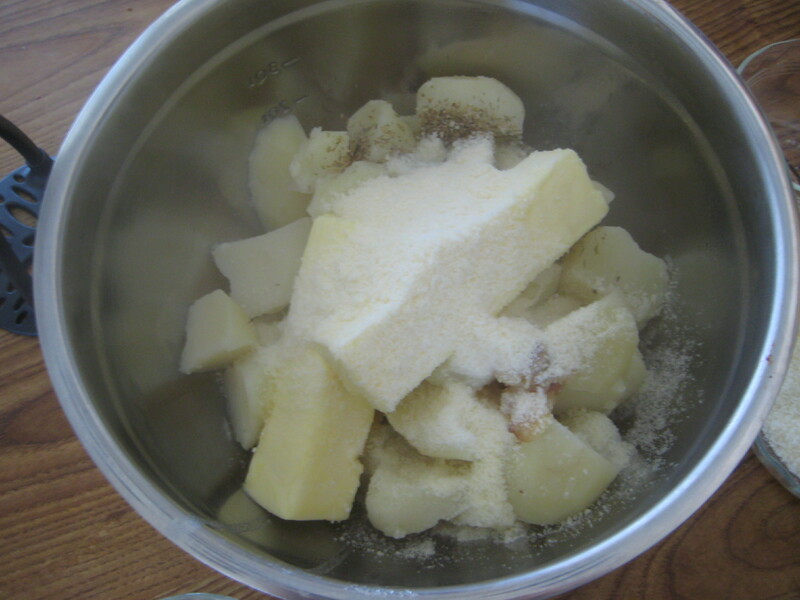 Step 4: Add the potatoes to a large mixing bowl. 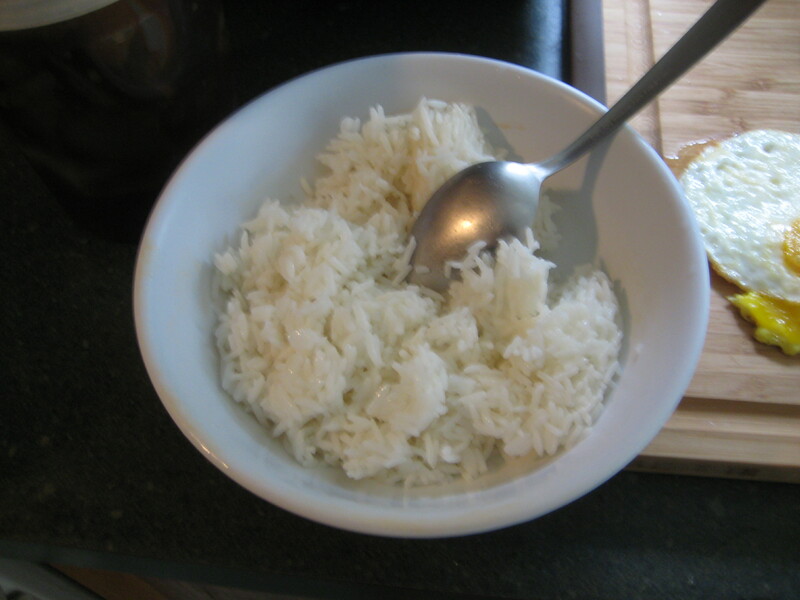 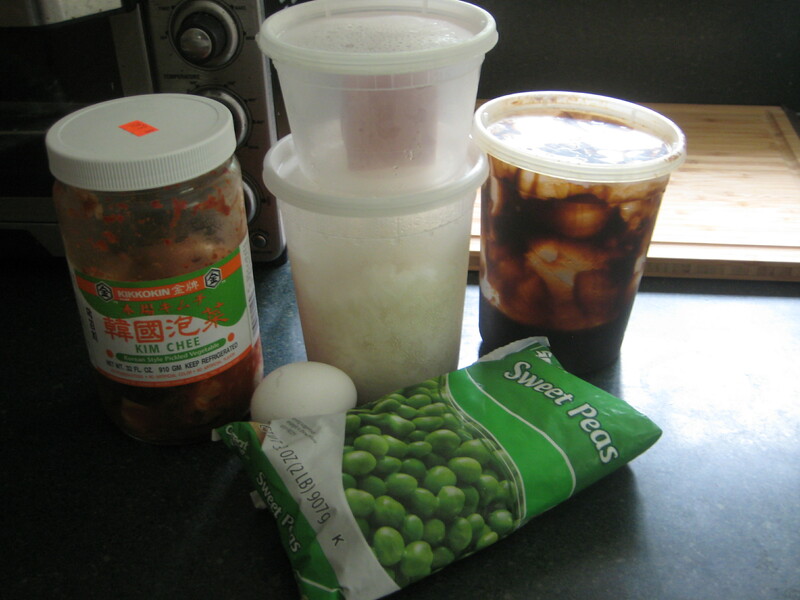 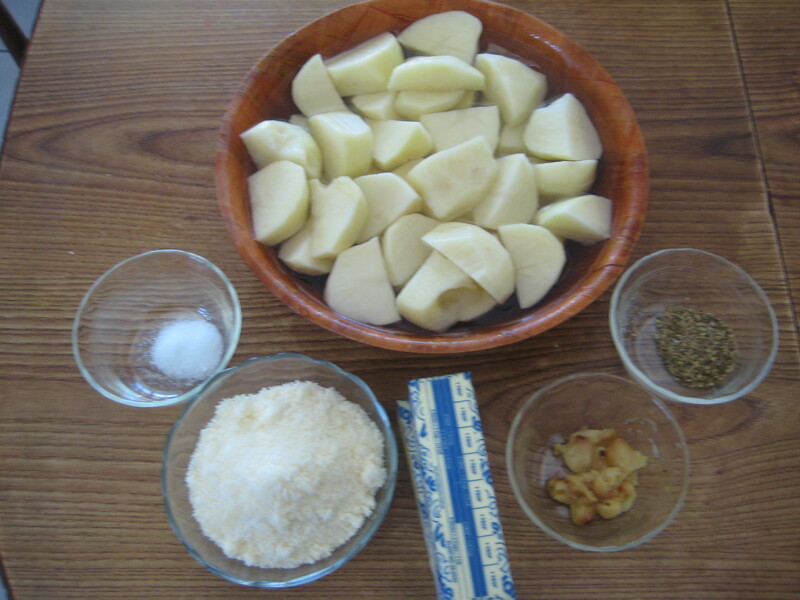 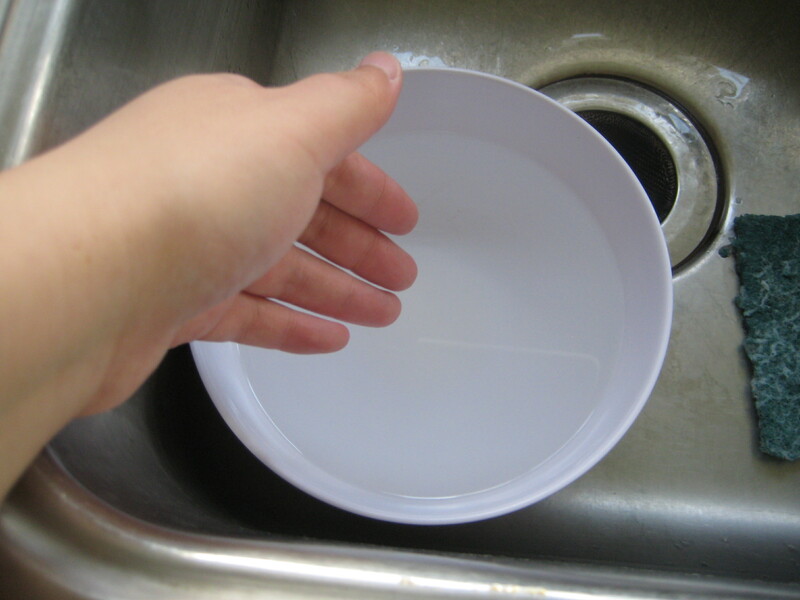 Step 5: Add the rest of the ingredients to the bowl. 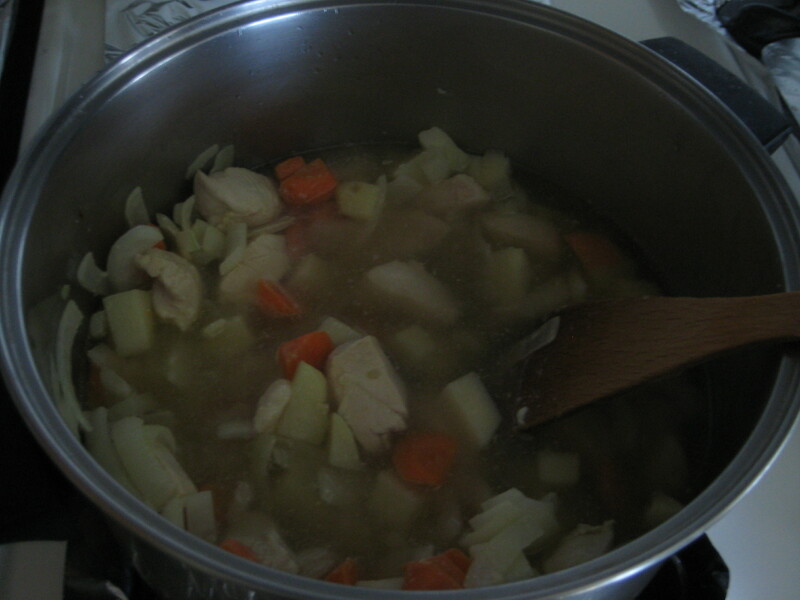 It’s now early autumn and raining constantly. 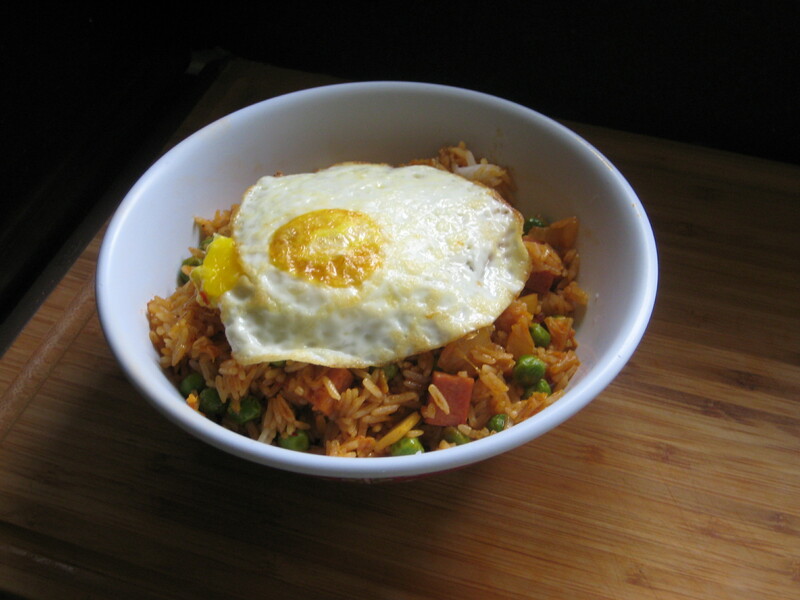 I wanted to make something comforting and effortless. 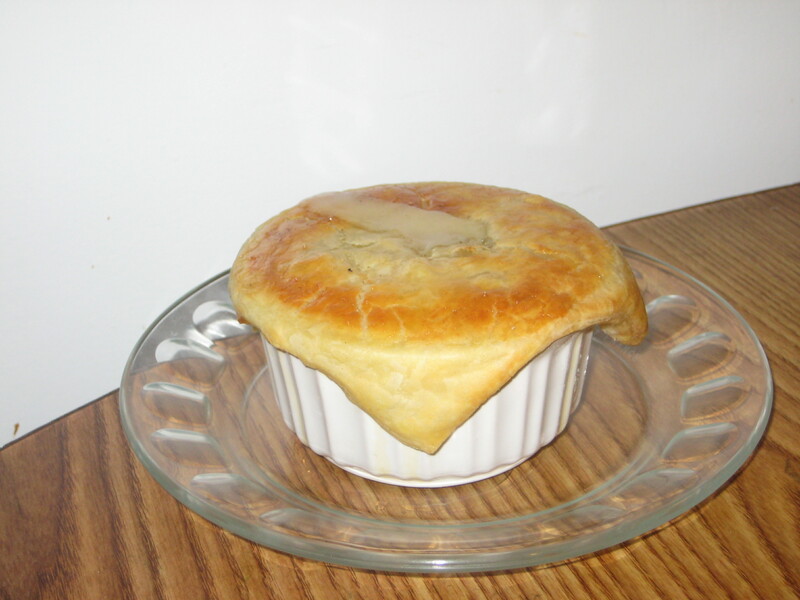 So I figured a chicken pot pie would do the trick. 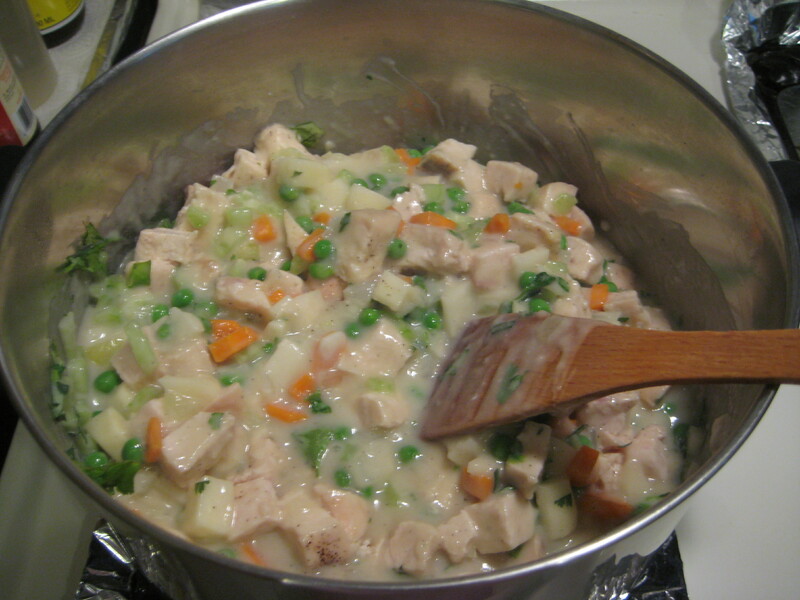 Finding a decent recipe was pretty simple, since the last time I had homemade chicken pot pie it was terrible. 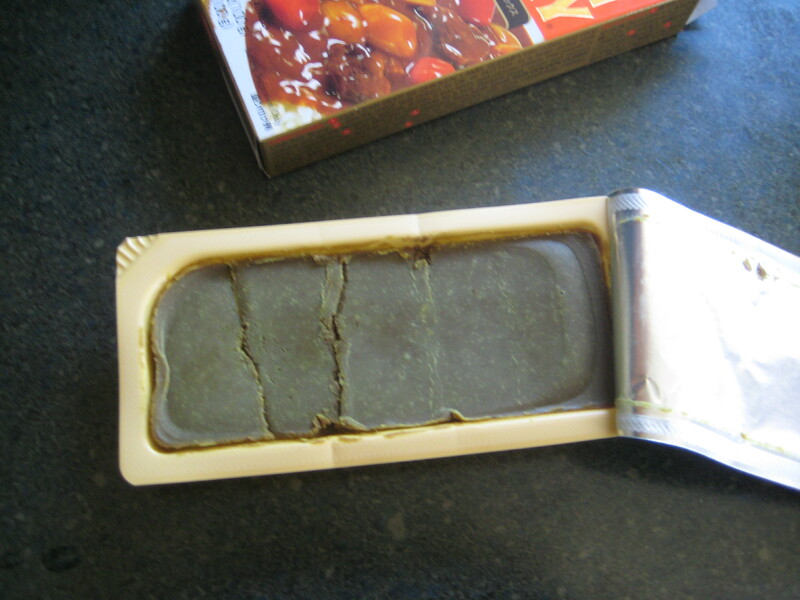 Sorry dad, but it was dry and salty. 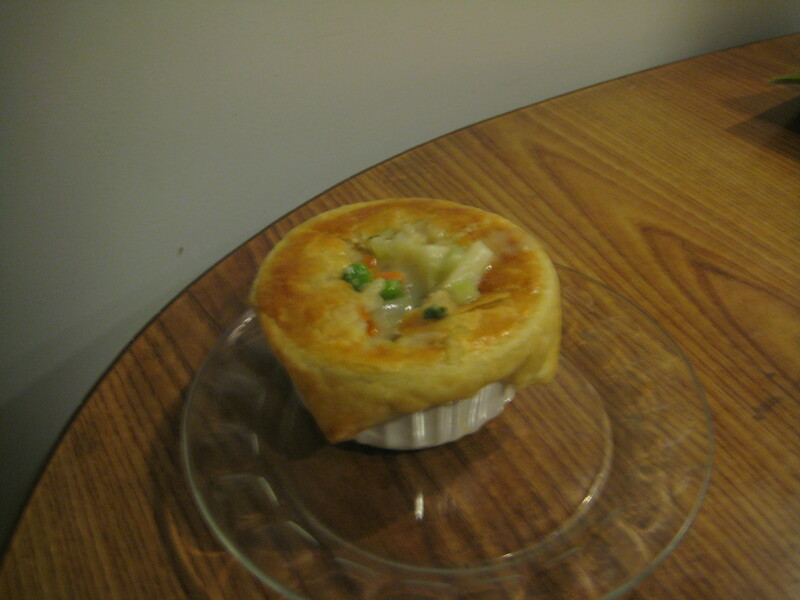 Spotting Ina Garten’s Chicken Pot Pie episode it seemed pretty easy to make. 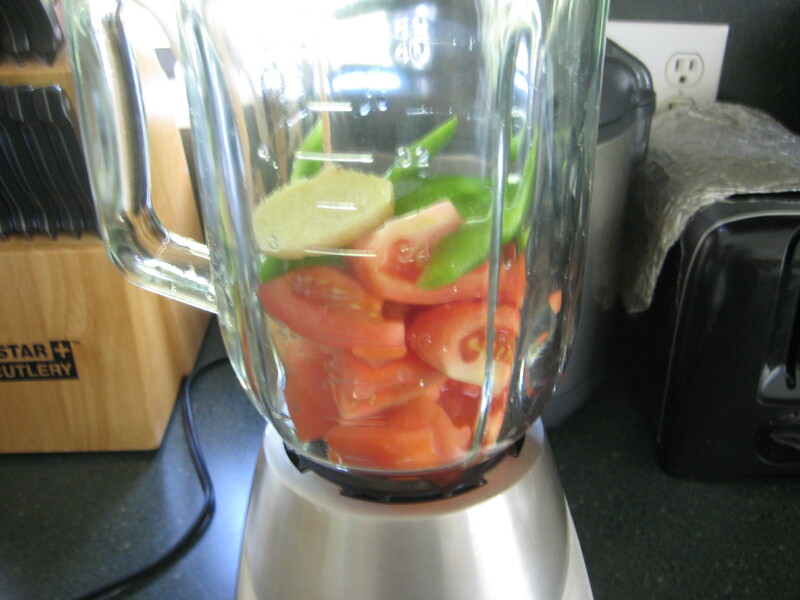 With a few adjustments to suit my needs and such. 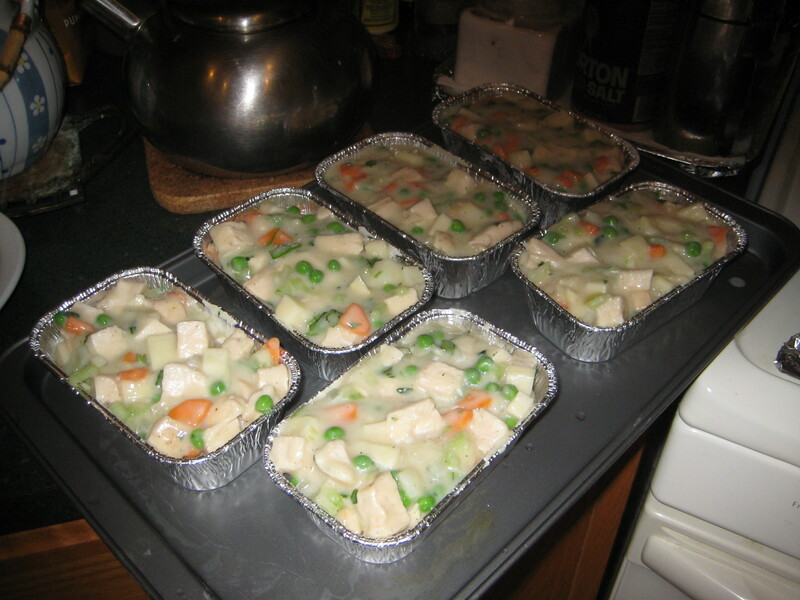 I will also be showing you how to freeze this delicious chicken pot pies. 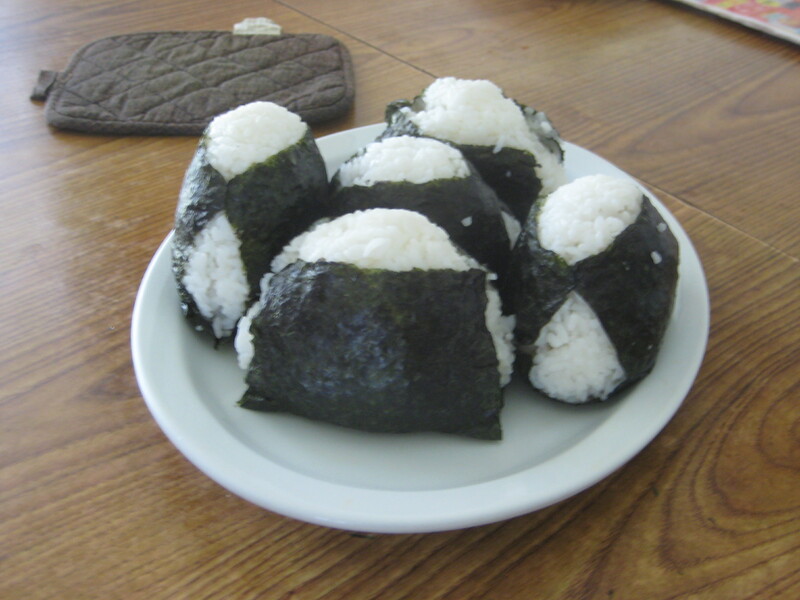 Found the idea from The Kitchen. 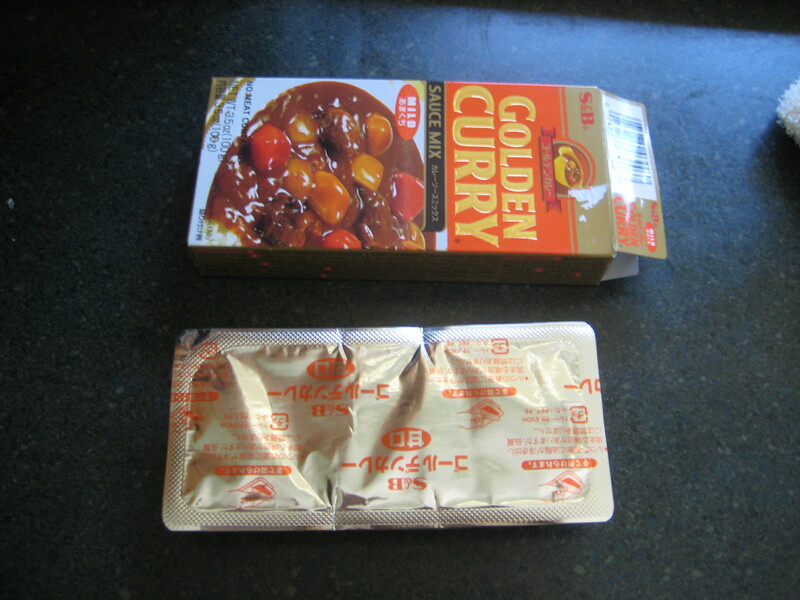 The containers that I will used are the Hefty 3ct EZ Foil Mini Loaf Pans. 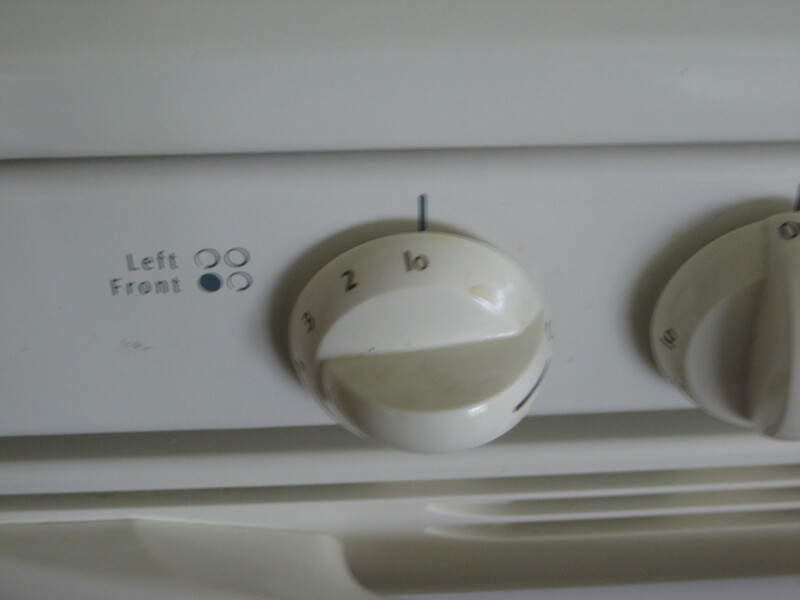 Step 1: Preheat the over to 350°F. 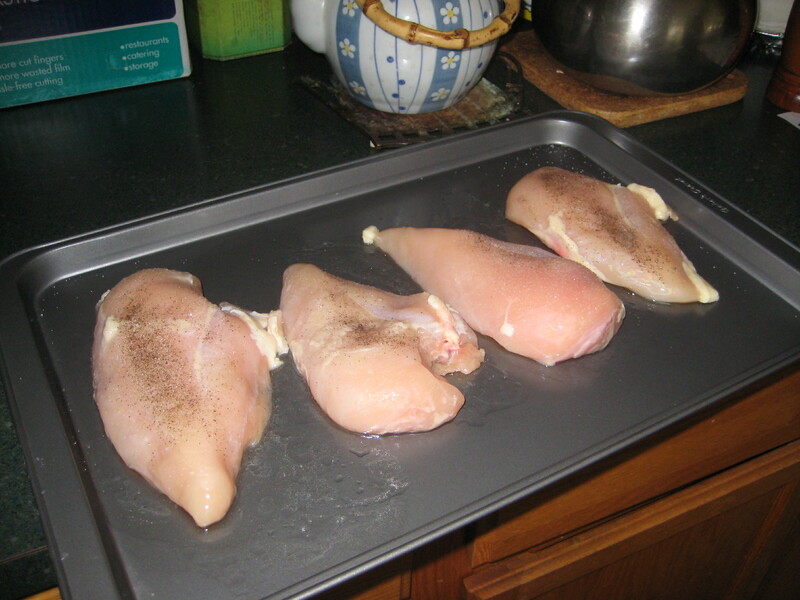 Step 2: Place the chicken breast on a baking sheet and rub the olive oil over them. 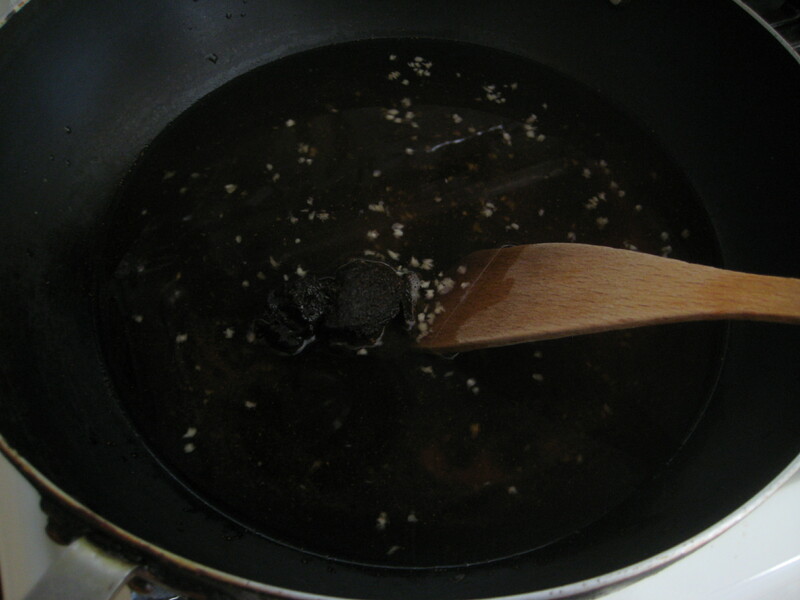 Step 3: Sprinkle generously with the salt and ground pepper. 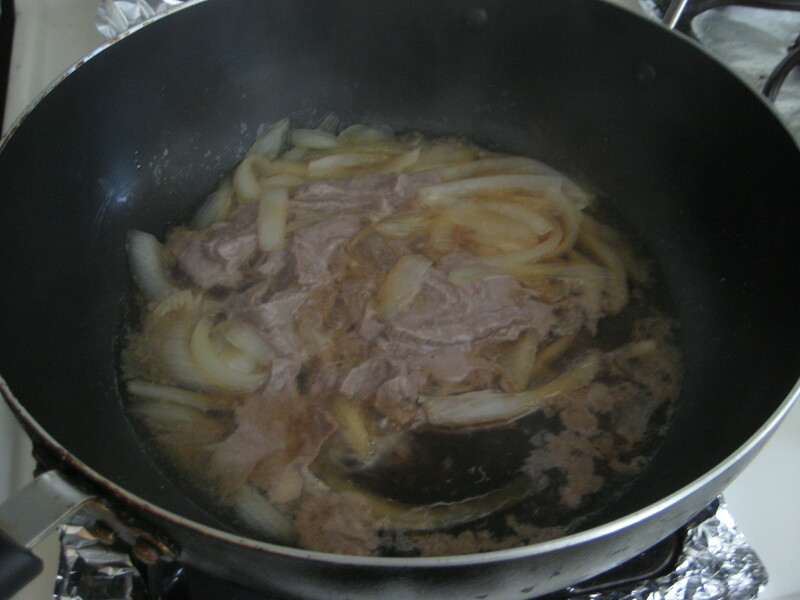 Step 4: Roast for 20-30 minutes, or until cooked through. 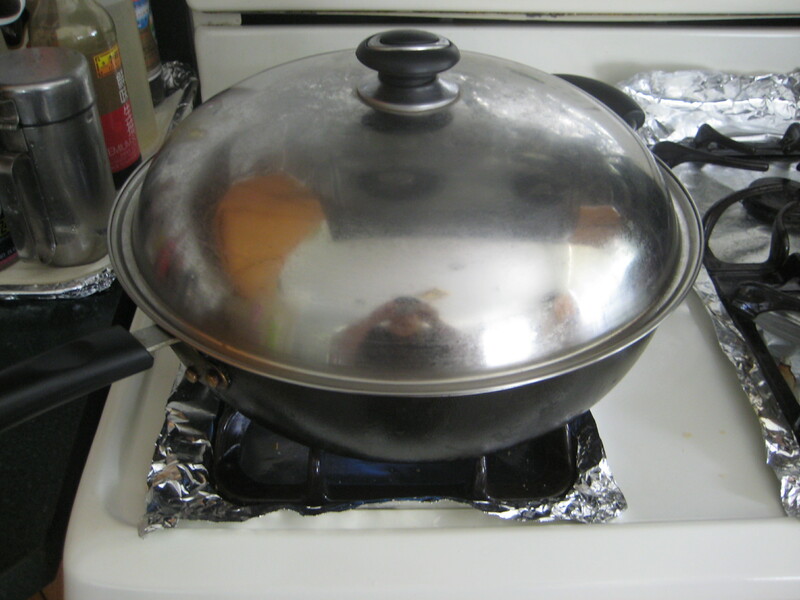 Step 5: Set aside until cool enough to handle. 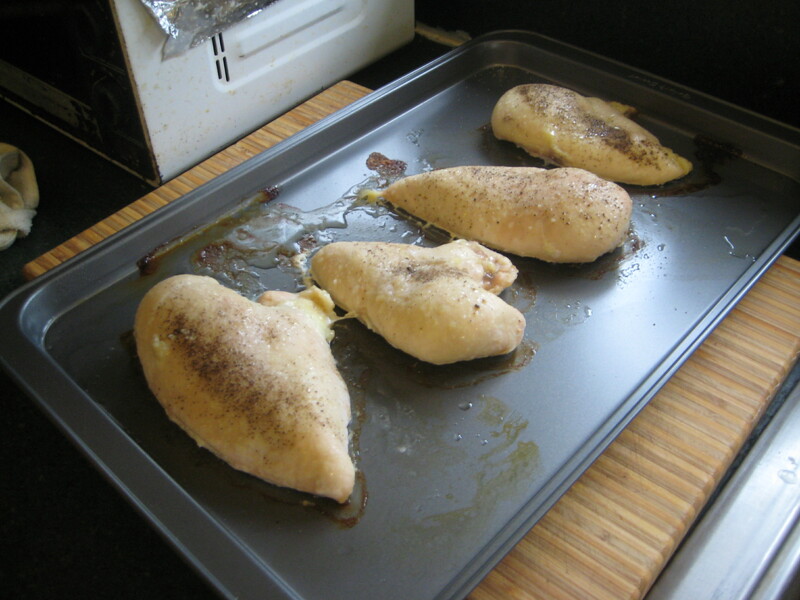 Step 6: Cut the chicken breasts into large dices, about 4-6 cups. 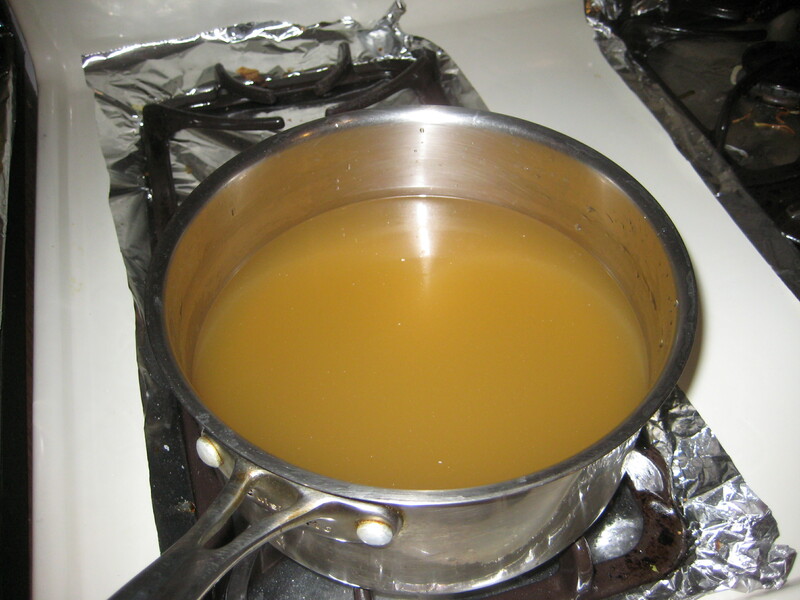 Step 7: In a small saucepan, heat the chicken stock. 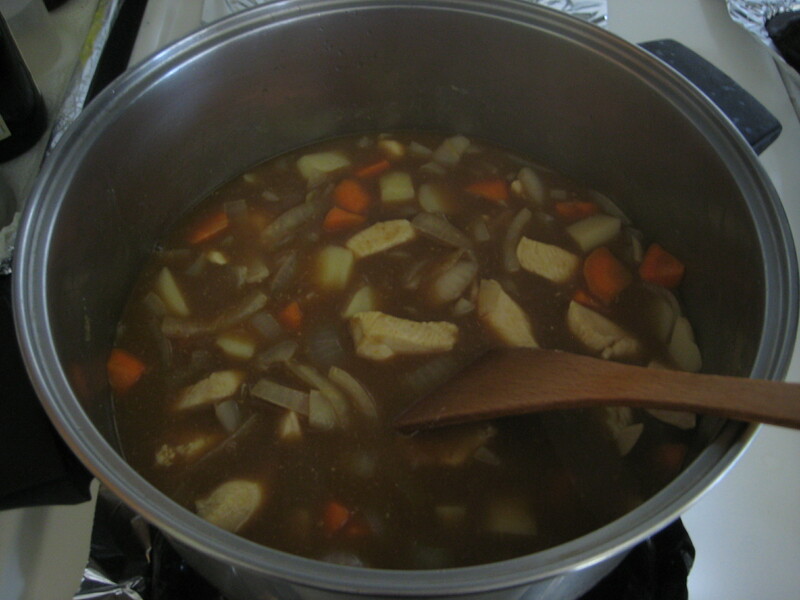 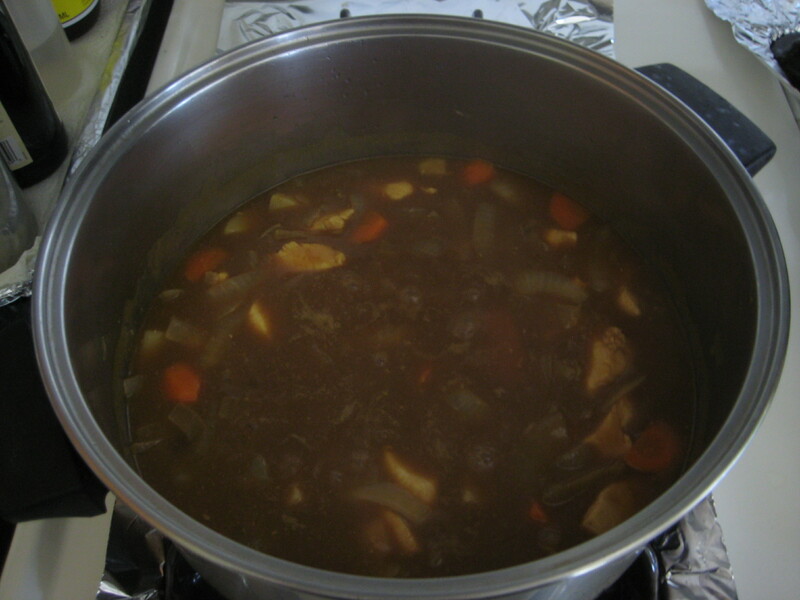 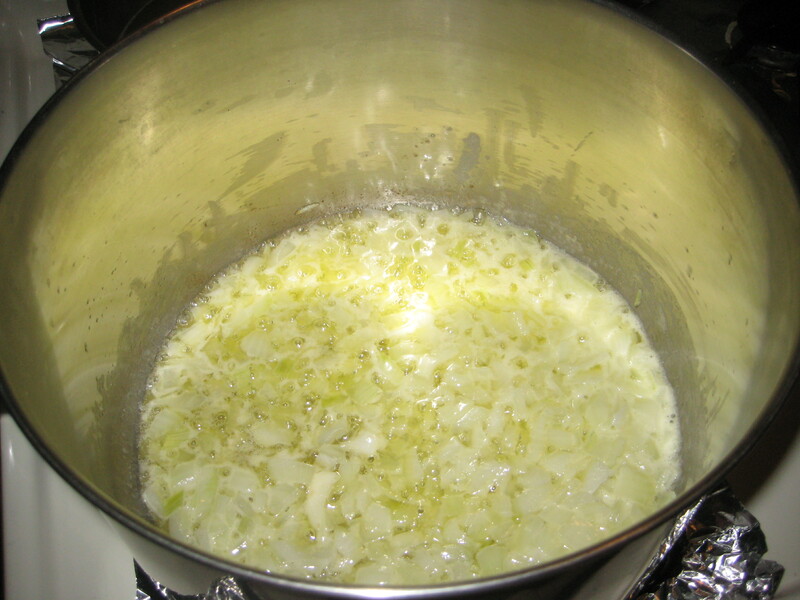 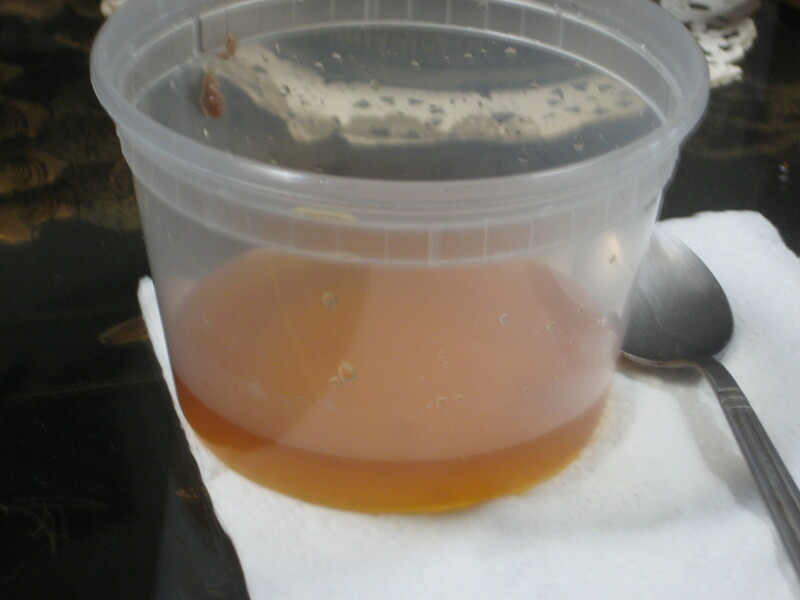 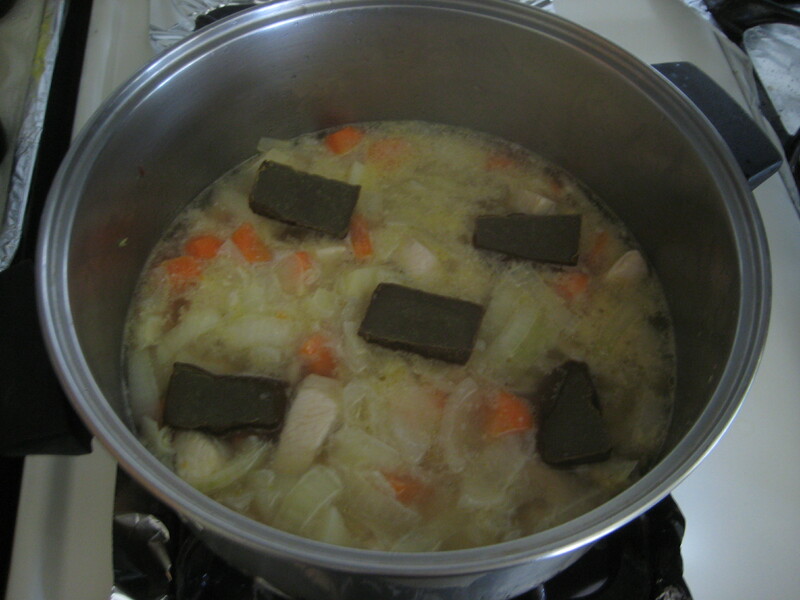 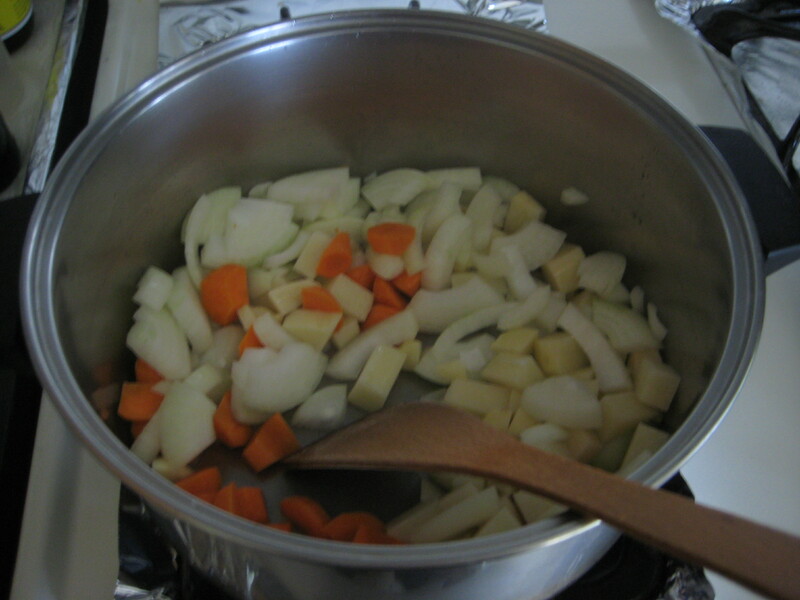 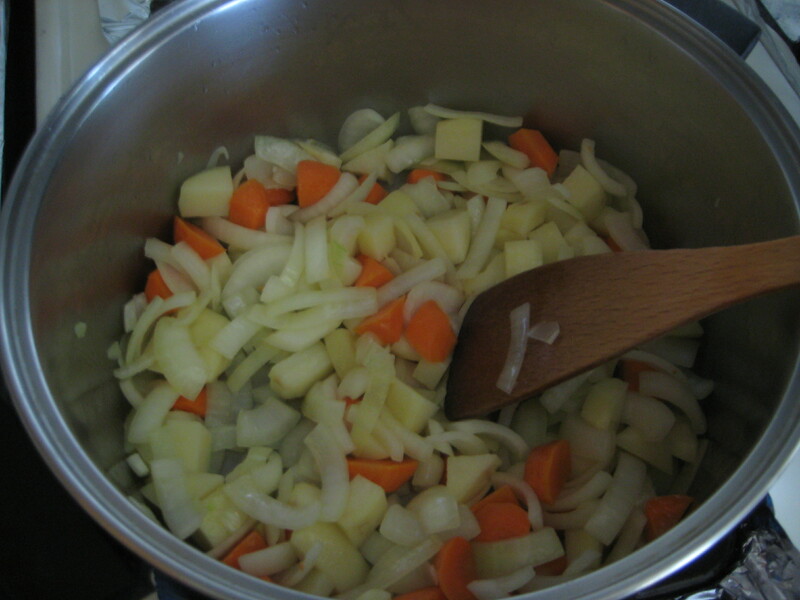 Step 8: Dissolve the bouillon cubes in the stock and simmer over low heat. 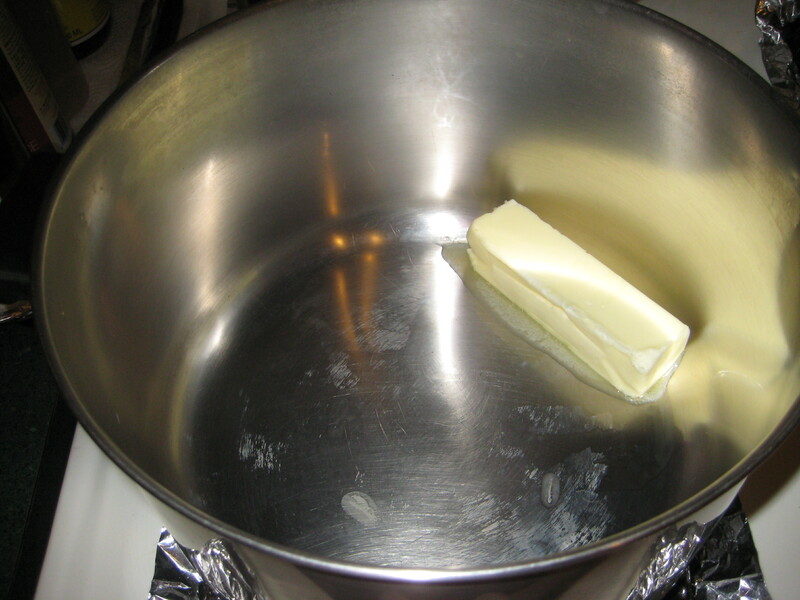 Step 9: In a large pot, melt the butter. 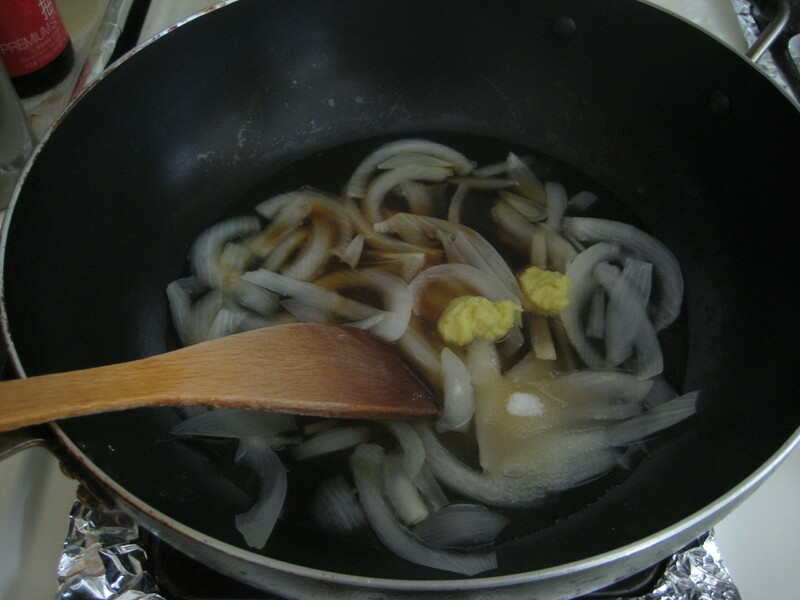 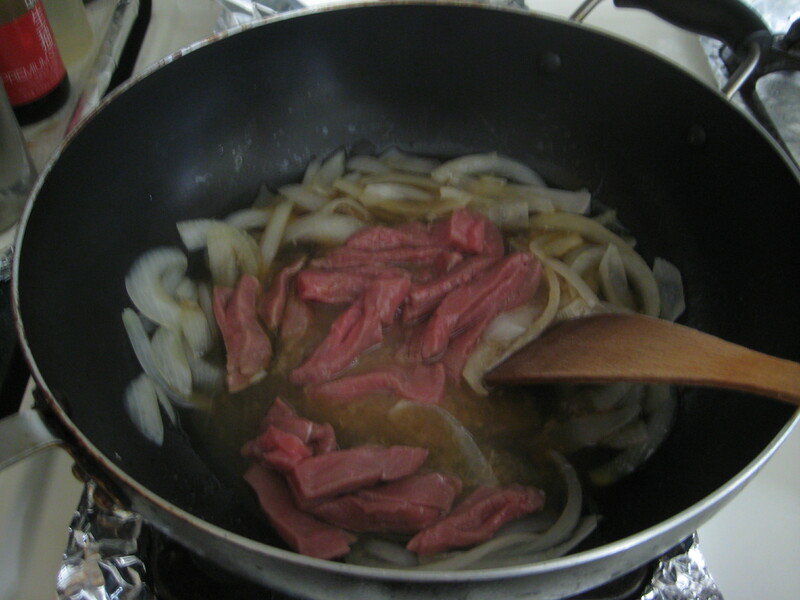 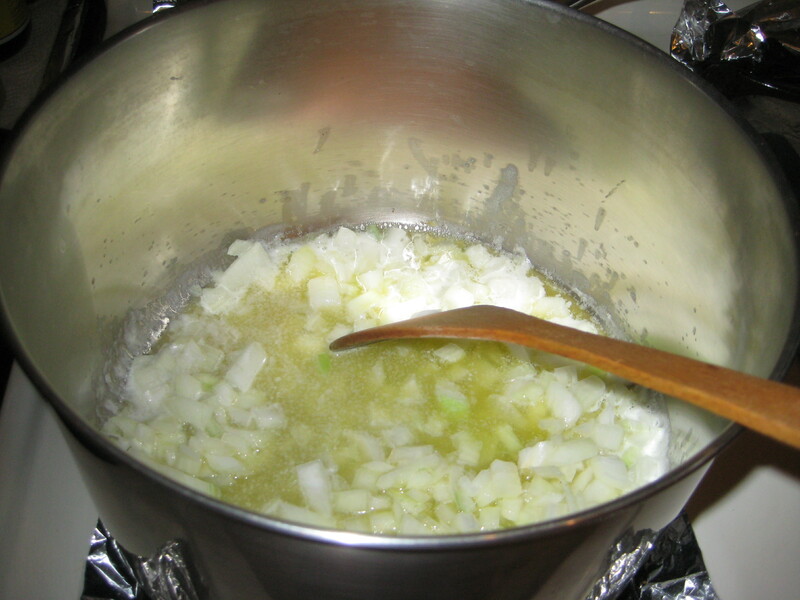 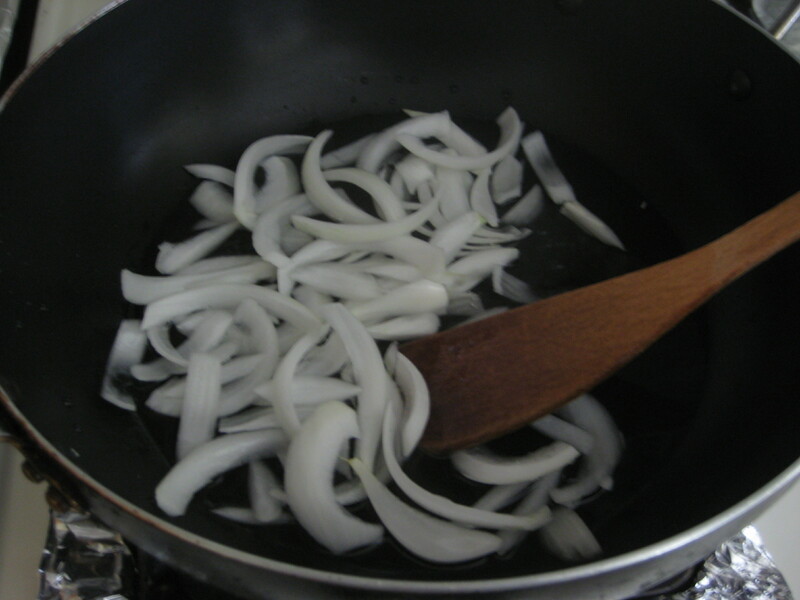 Step 10: Saute the onions over medium-low heat for 6-8 minutes, until onions are translucent. 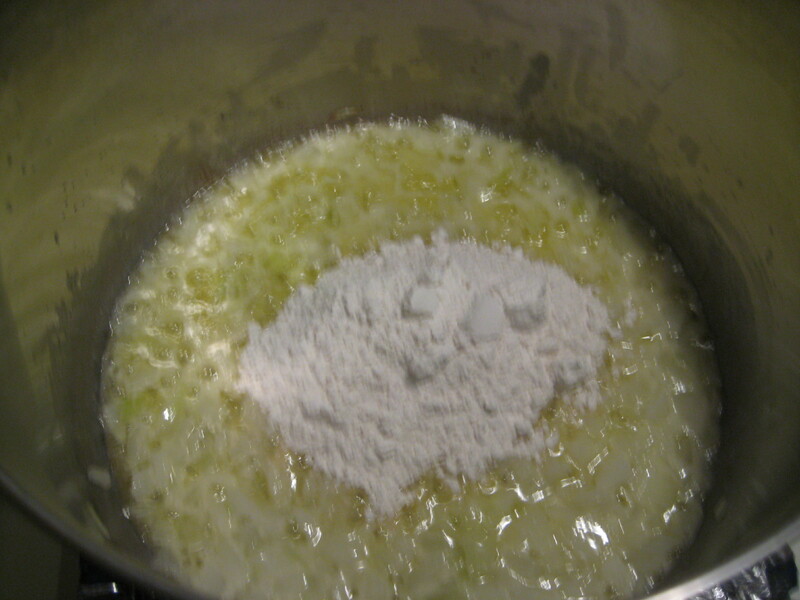 Step 11: Add the flour and cook over low heat, stirring constantly for 2 minutes. 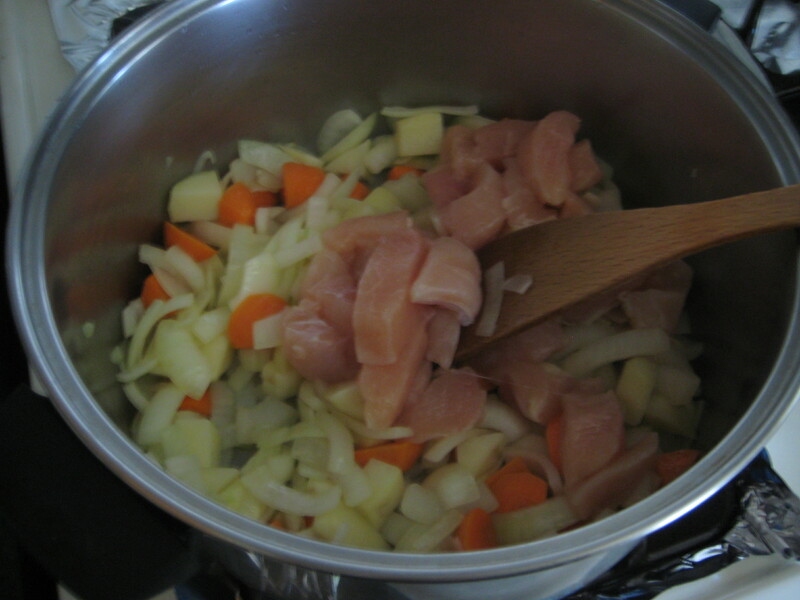 Step 12: Add in the hot chicken stock to the sauce. 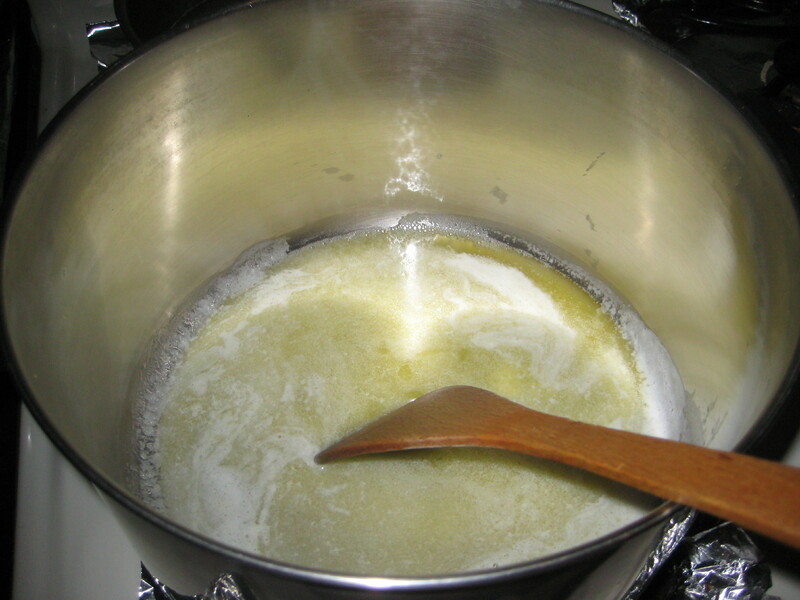 Step 13: Simmer over low heat for 1 minute until it thickens. 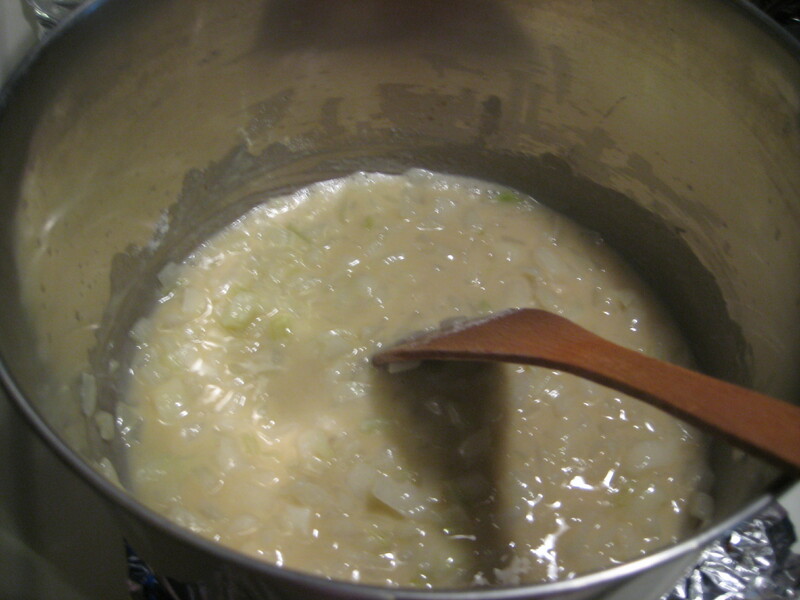 Step 14: Add in 2 tsp. 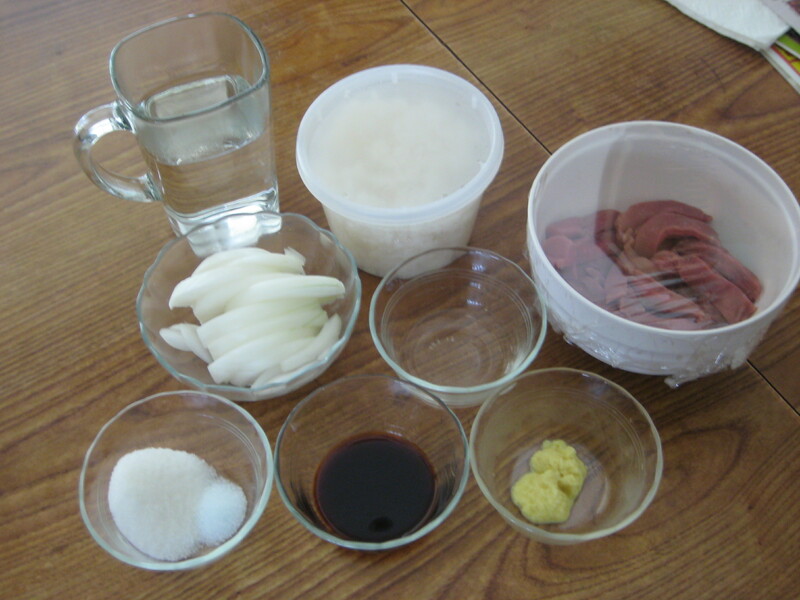 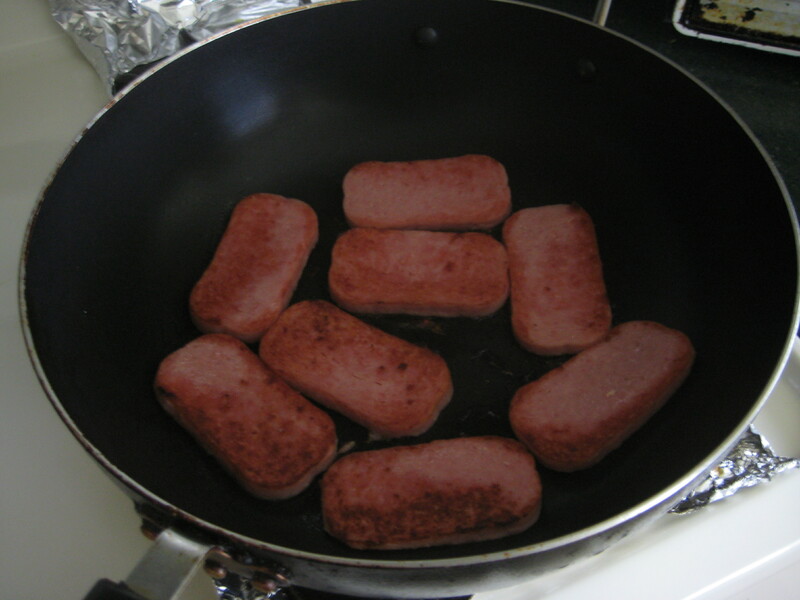 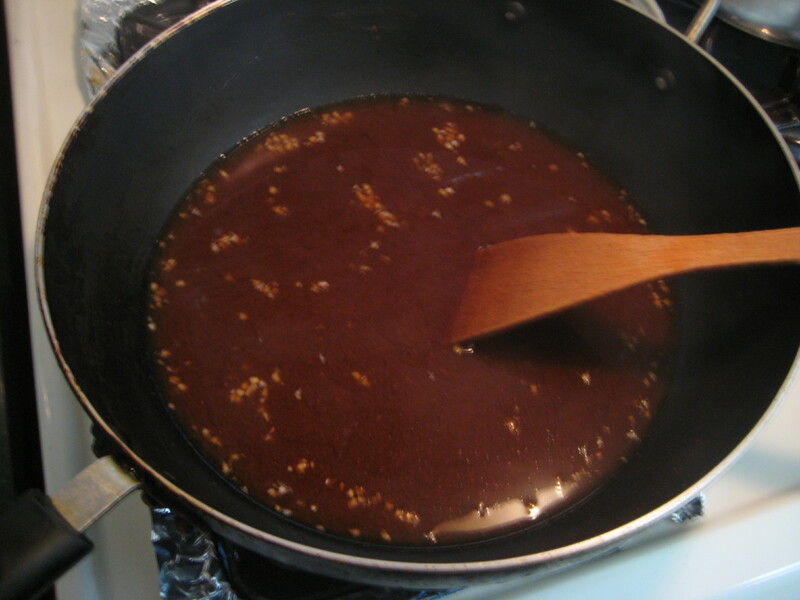 salt, 1/2 tsp. 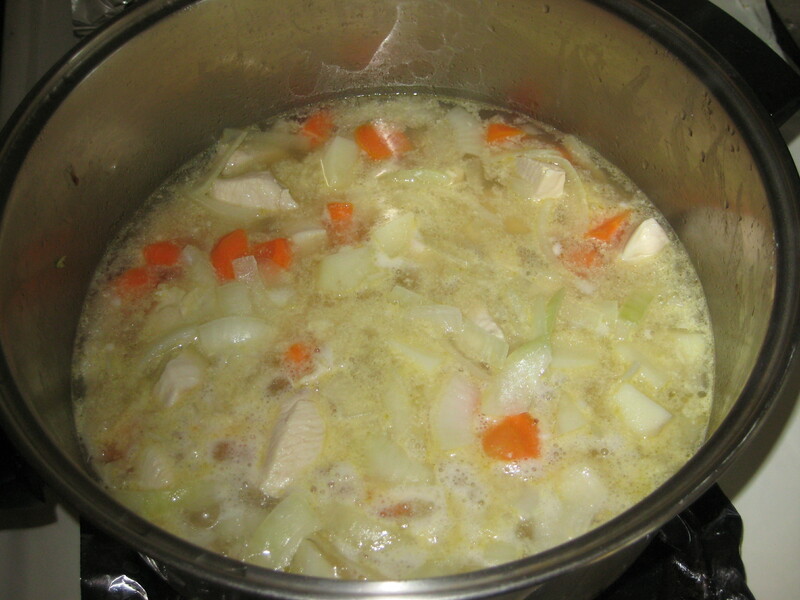 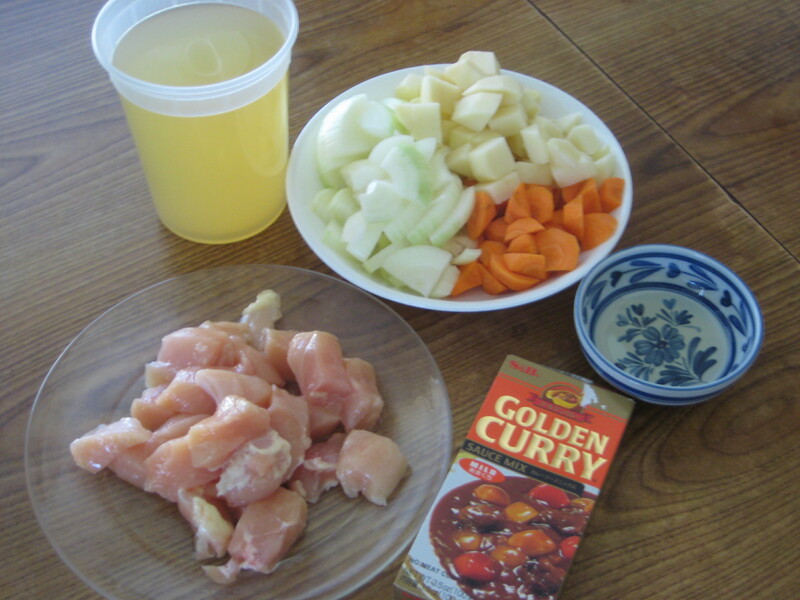 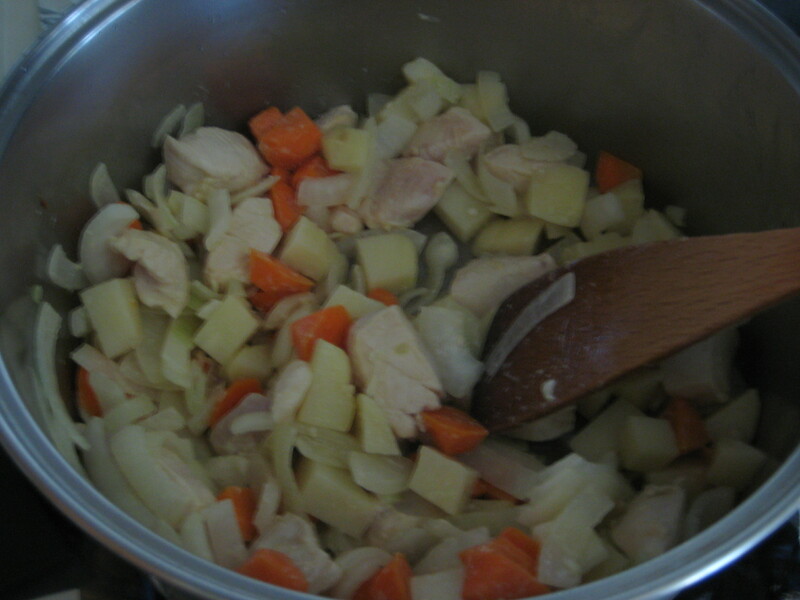 ground pepper, heavy cream, carrots, celery, potatoes, herbs, and cooked chicken. 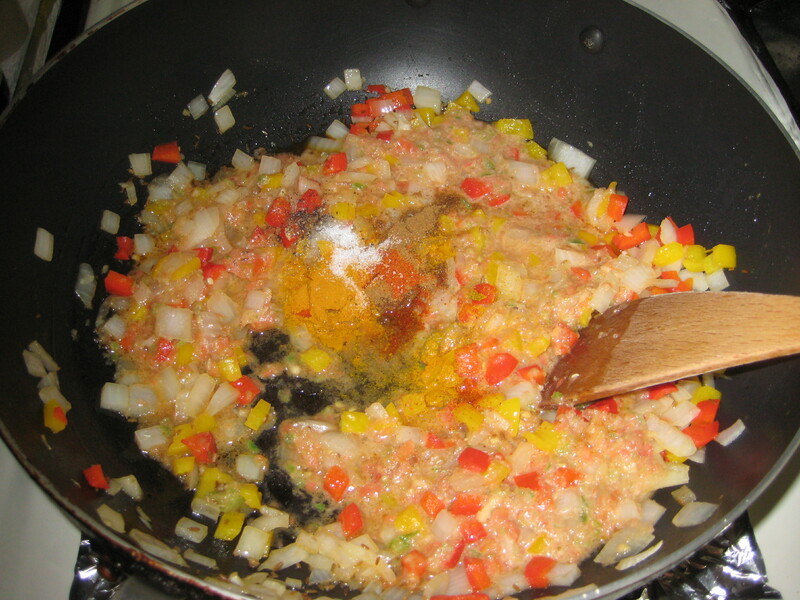 Mix well and remove from heat. 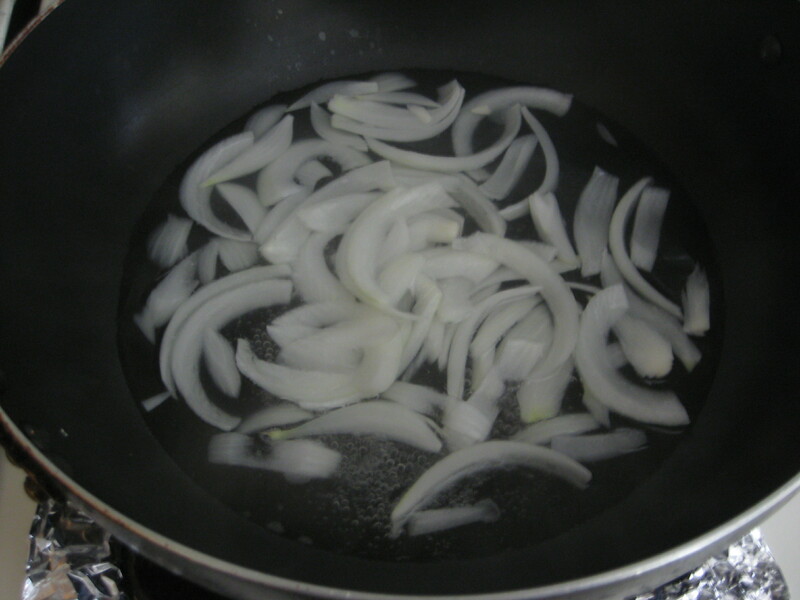 Step 15: Preheat the over to 375°F. 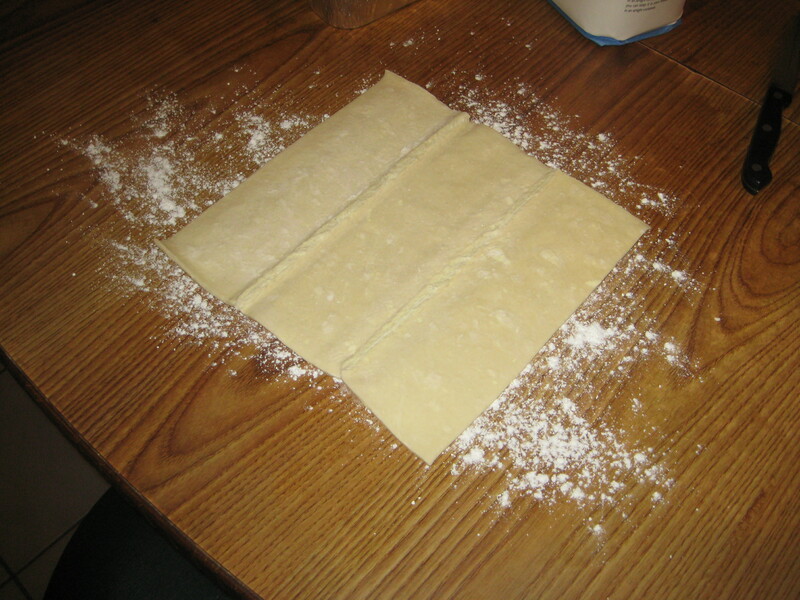 Step 16: Roll out puff pastry on a floured surface until 1/4 inch thick. 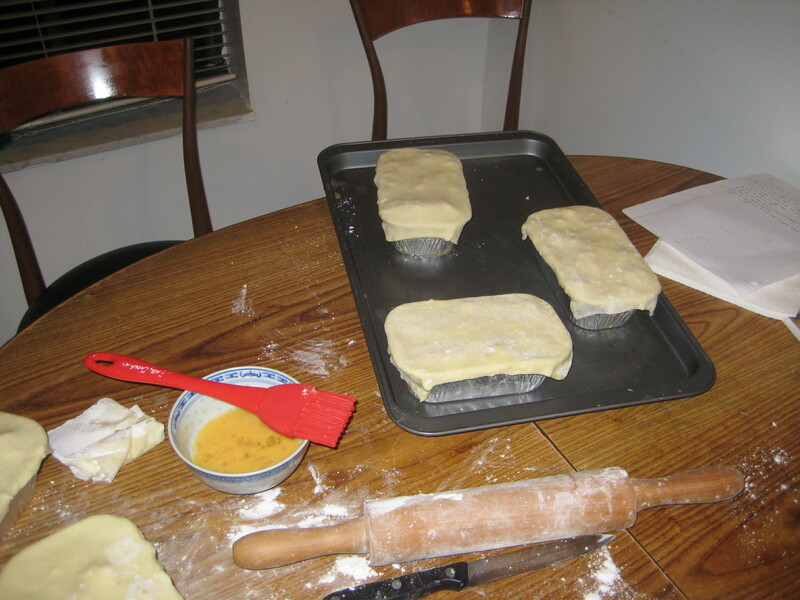 Step 17: Using foil containers to gauge size, cut pastry into rectangles, leaving enough space to fold over edges of containers, about 1/2-inch. 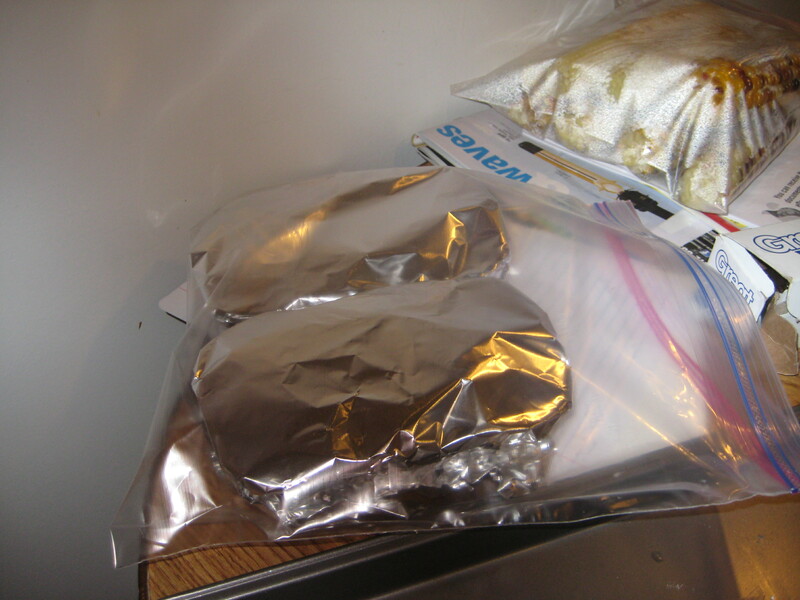 Step 19: Brush sides and edges of foil containers with egg-wash. 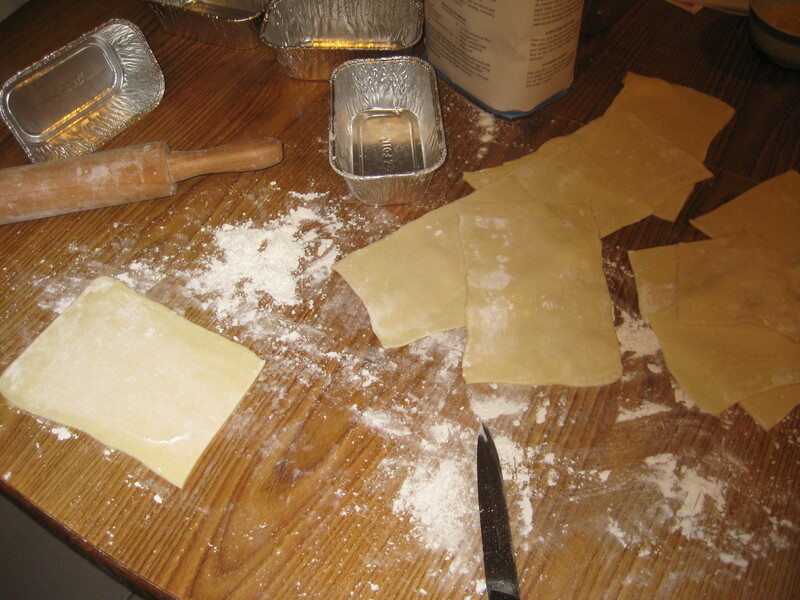 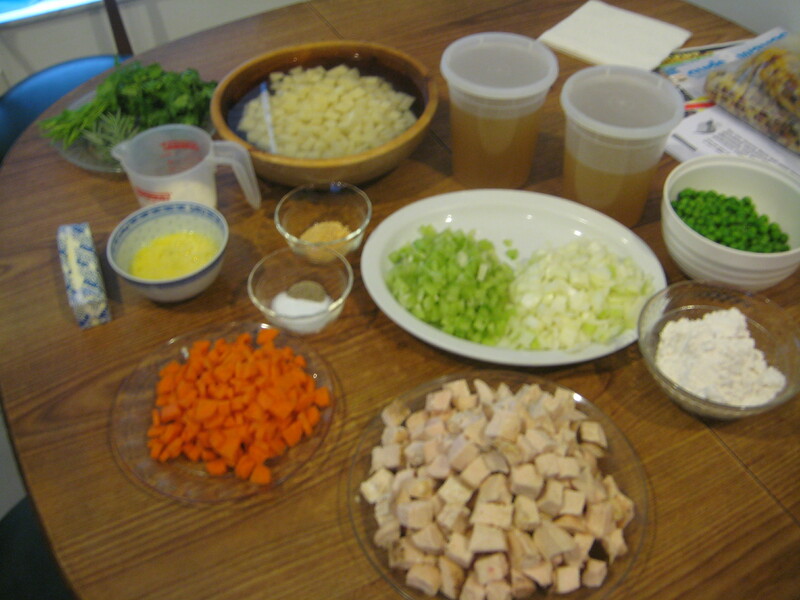 Step 21: Brush tops of pot pies with egg and cut several slits to allow steam to escape. 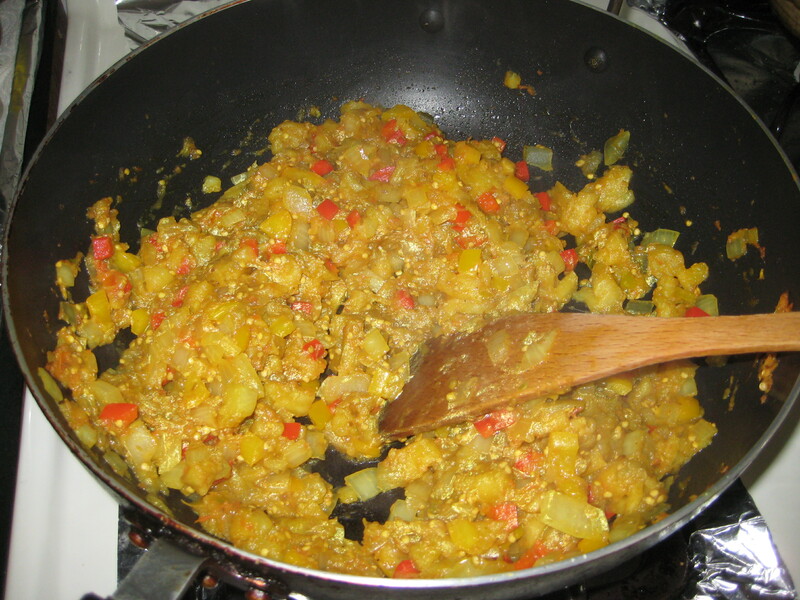 I’ve always wanted to make Baingan Bhartha (Eggplant) ever since I had it once in the Indian restaurant a few months ago. 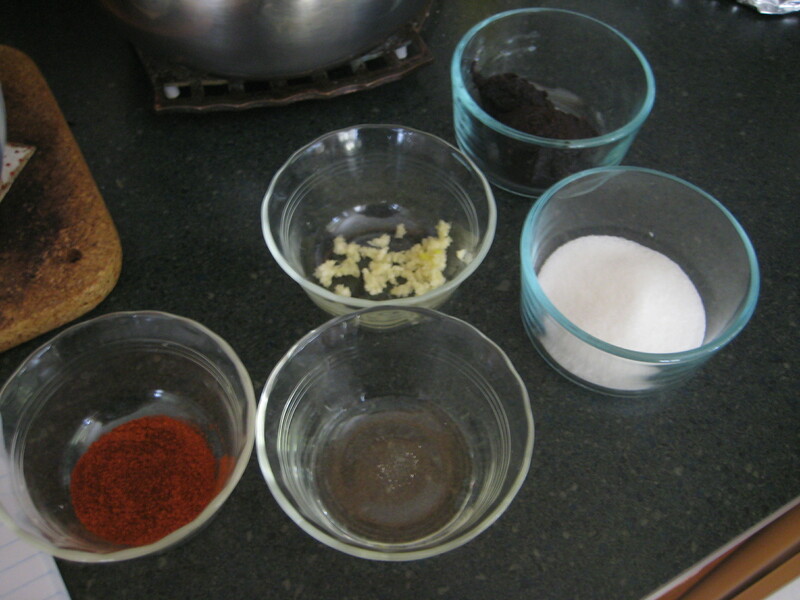 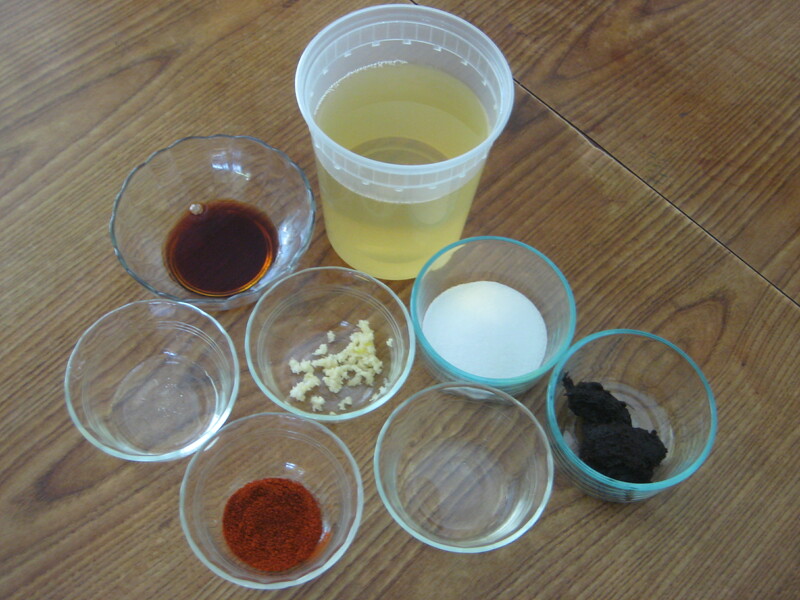 So I looked long and hard for a recipe that could emulate the flavors. 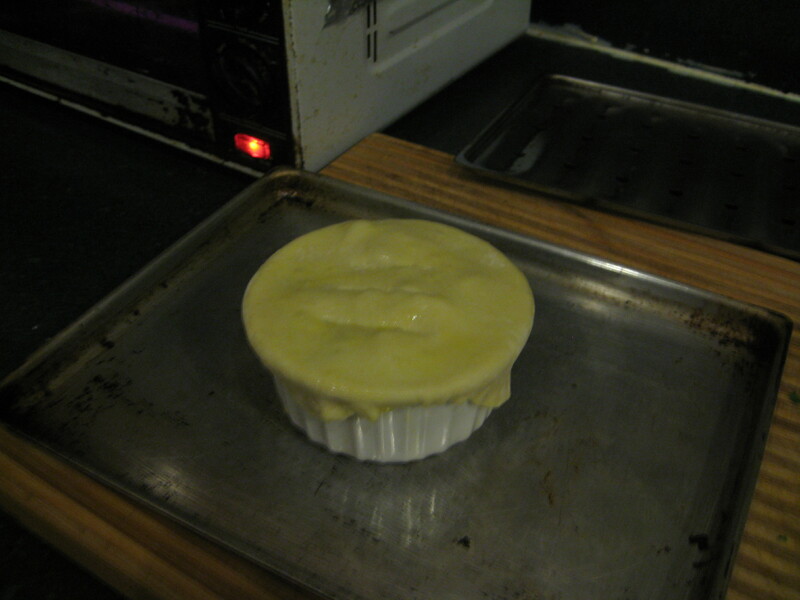 Step 1: Preheat the oven’s broiler. 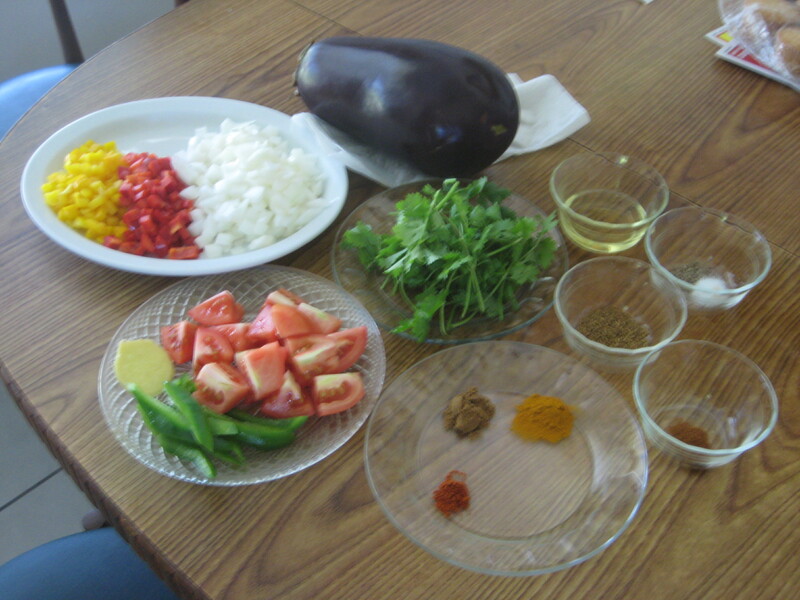 Step 2: Rub oil on the outside of the eggplant, or coat with cooking spray. 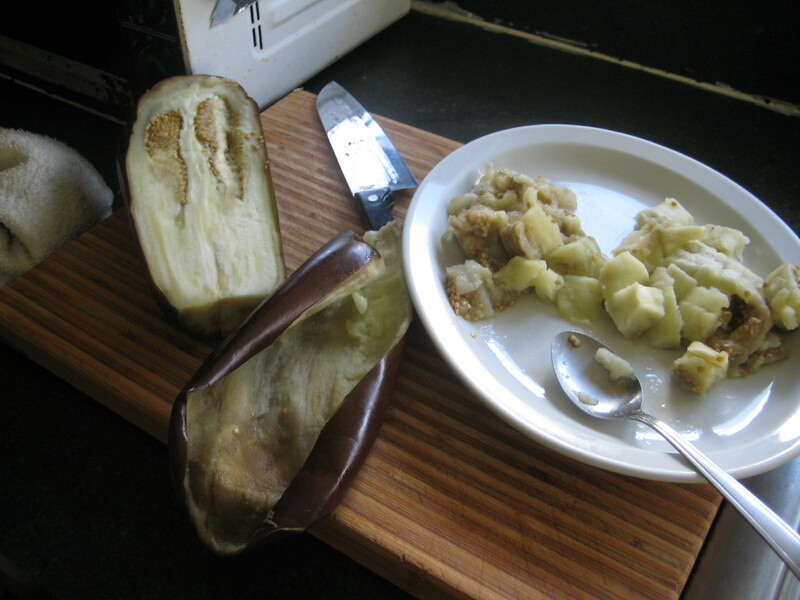 Step 4: Cut the eggplant in half lengthwise, and scoop the flesh out of the skin. 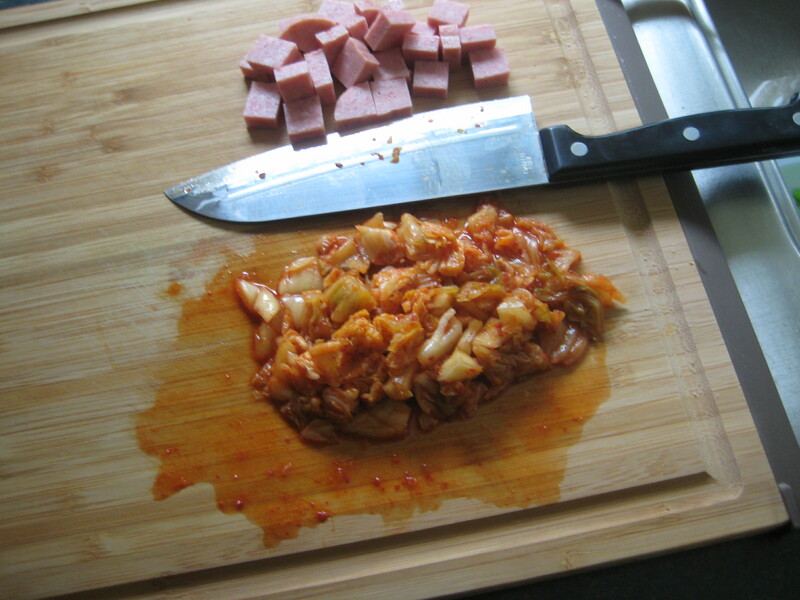 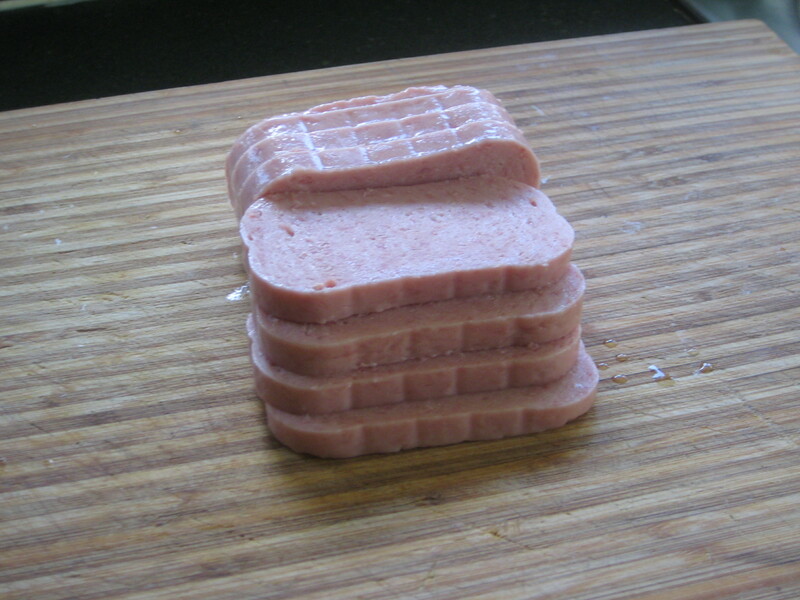 Discard the skin; chop up the flesh and set aside. 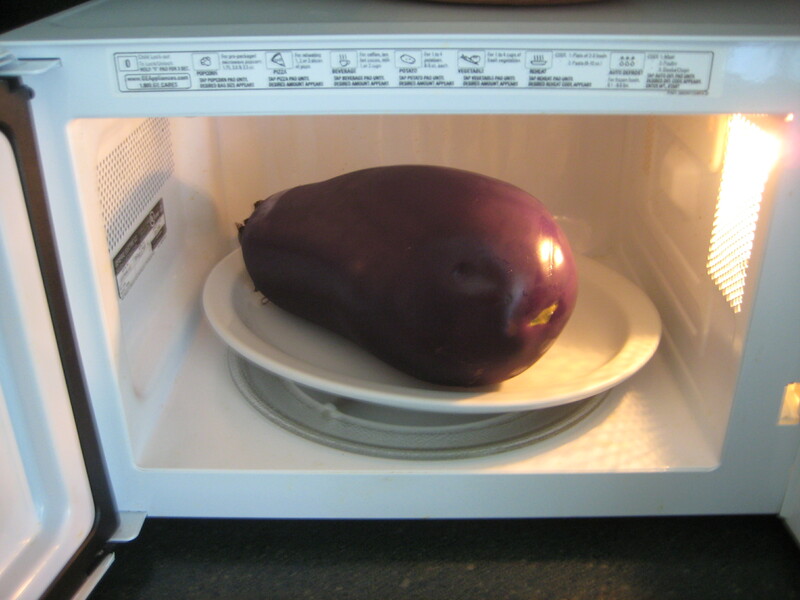 Step 1: Cook the whole eggplant (put it on a microwave safe dish) in microwave for 8 to 10 minutes until it is tender. 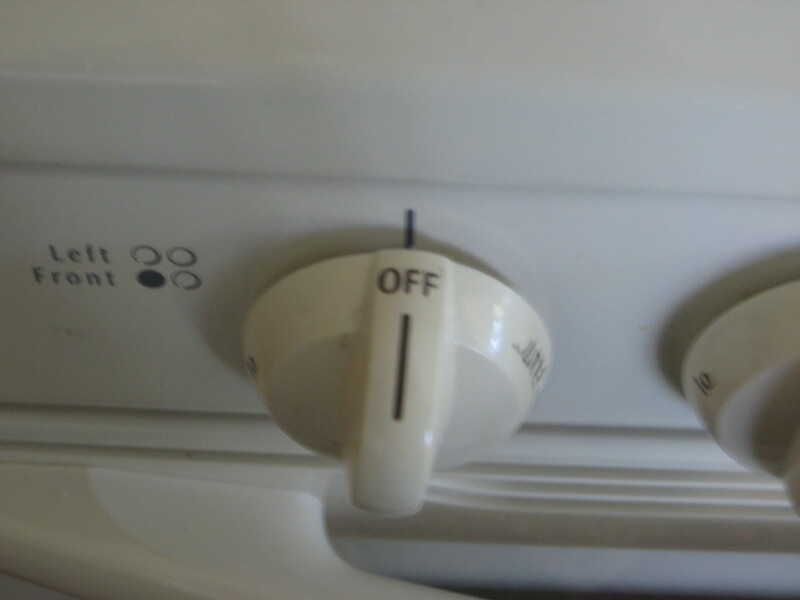 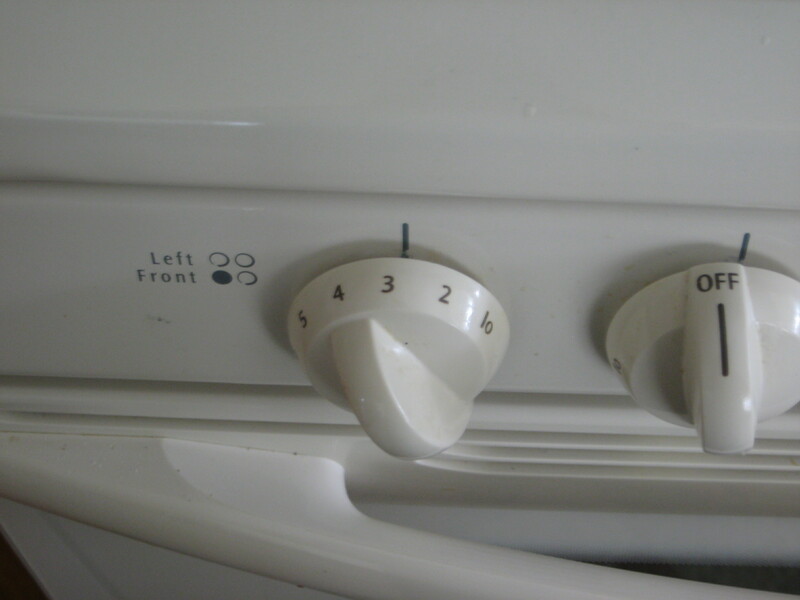 If you are using an oven, preheat the oven at 400 degrees F and bake it for about 45 minutes turning the sides every fifteen minutes. 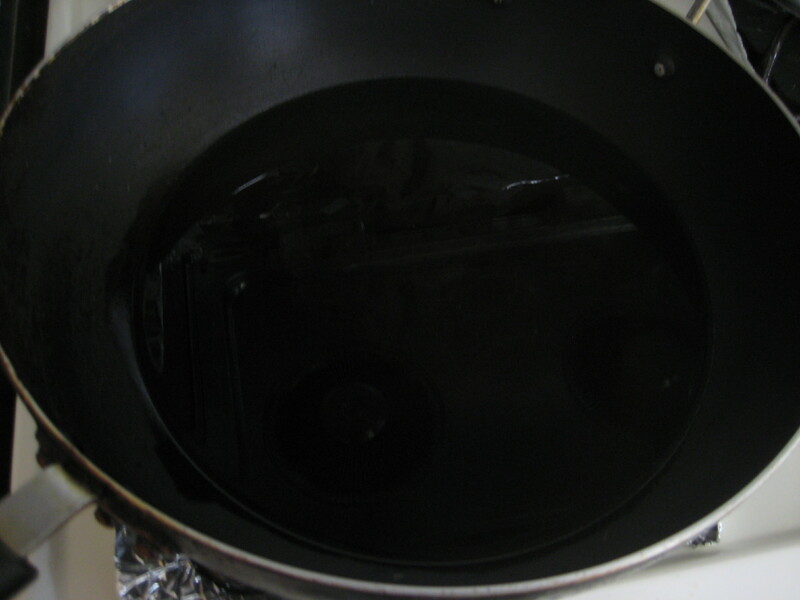 Be sure to first put the eggplant in an oven safe shallow bowl or a cookie sheet. 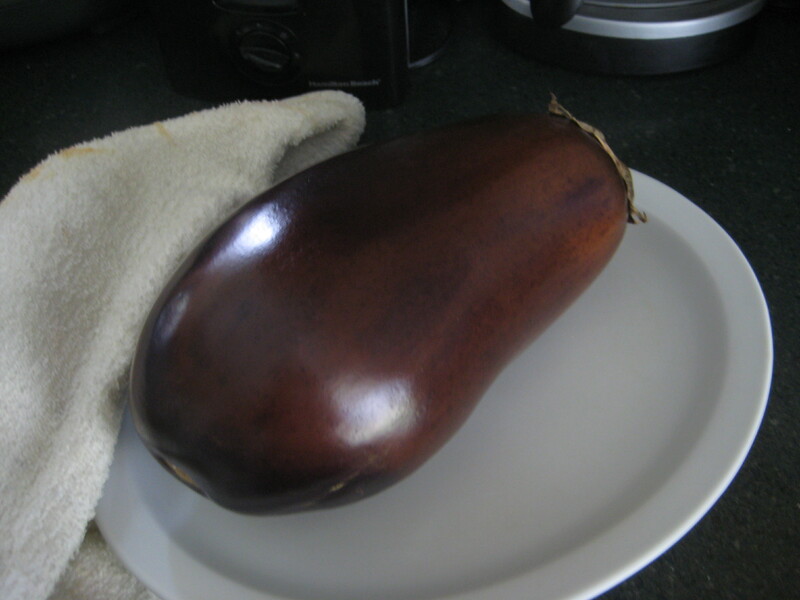 Step 2: Let it cool and scoop out the flesh, then chop the eggplant in small pieces and keep aside. 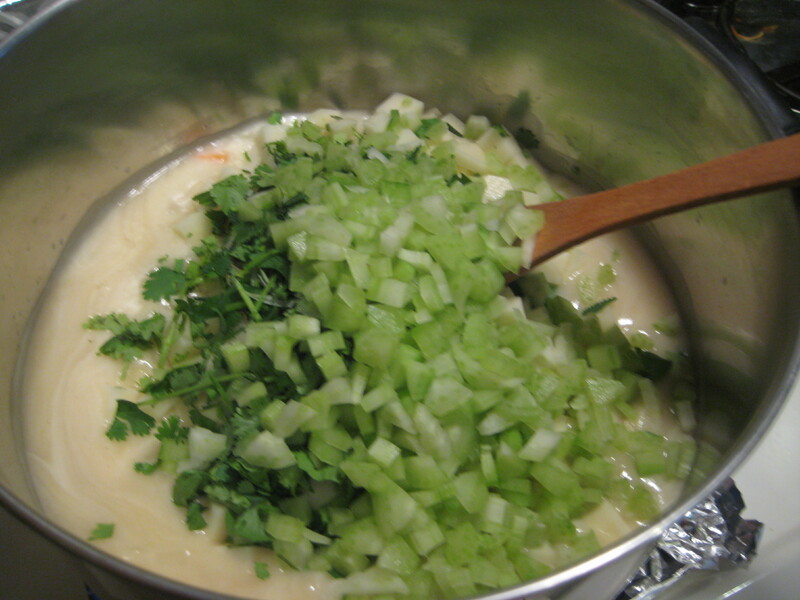 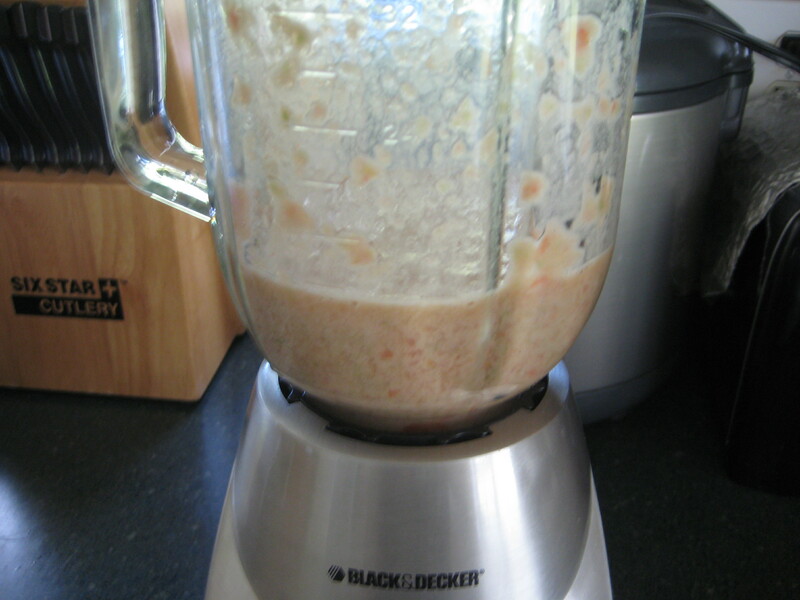 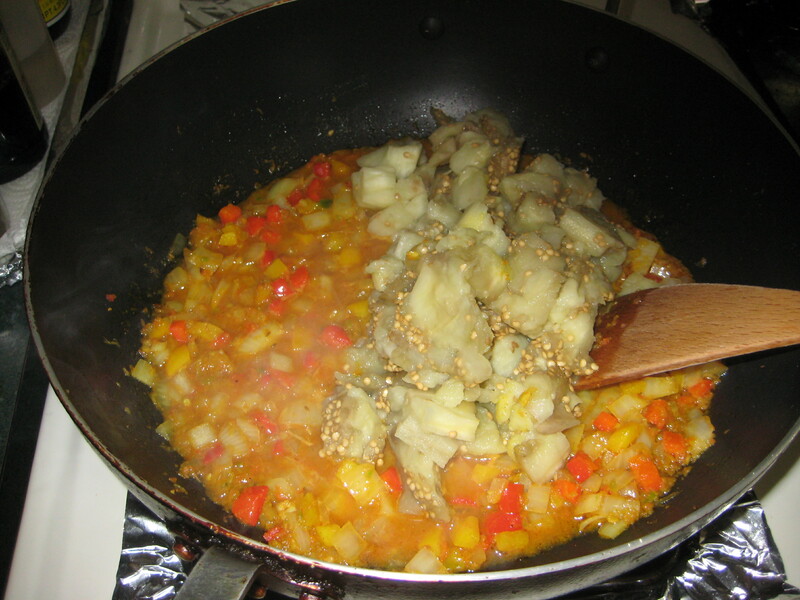 Step 3: Blend together the tomatoes, ginger and green chili; set aside. 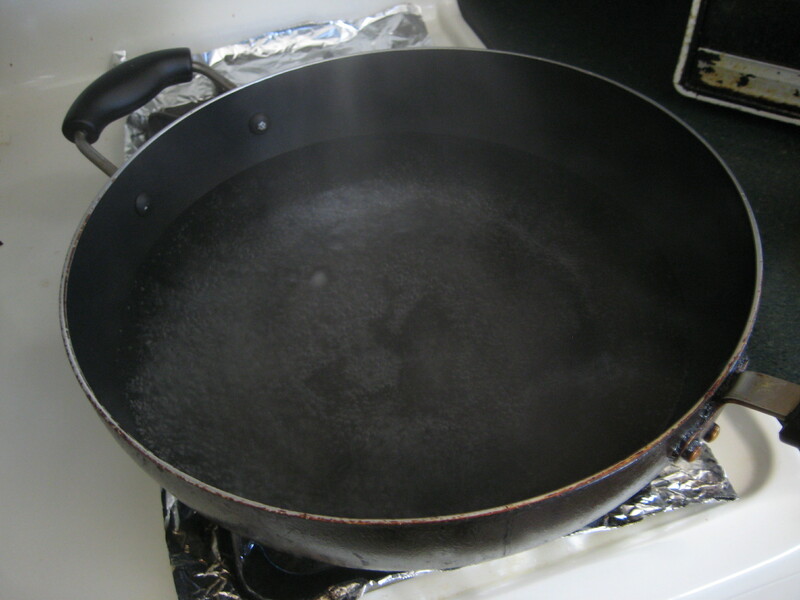 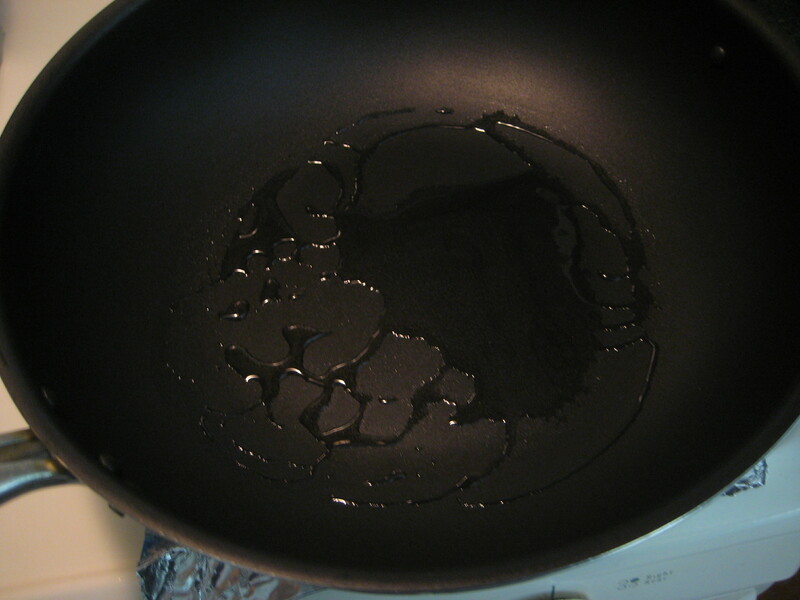 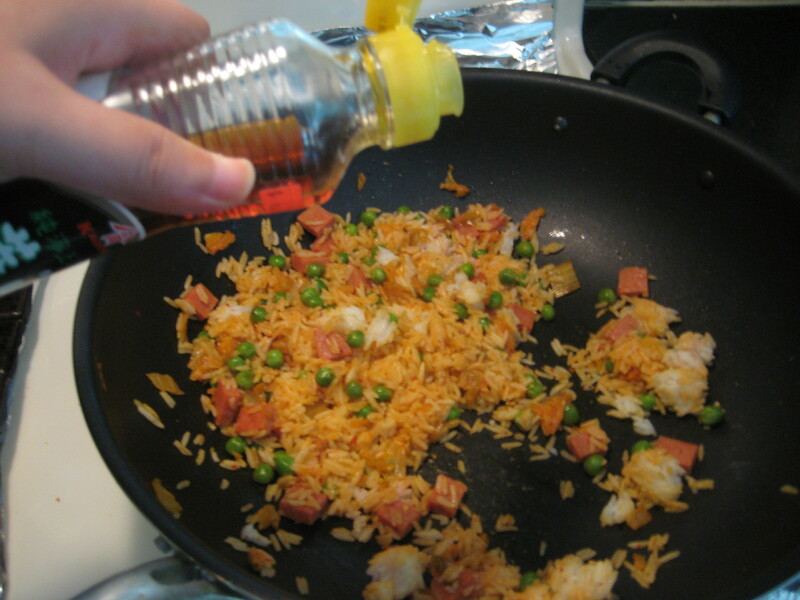 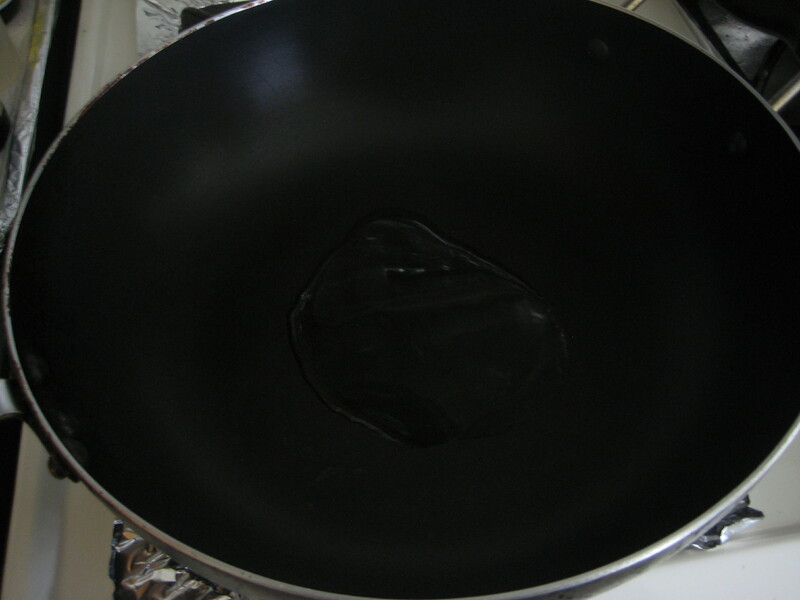 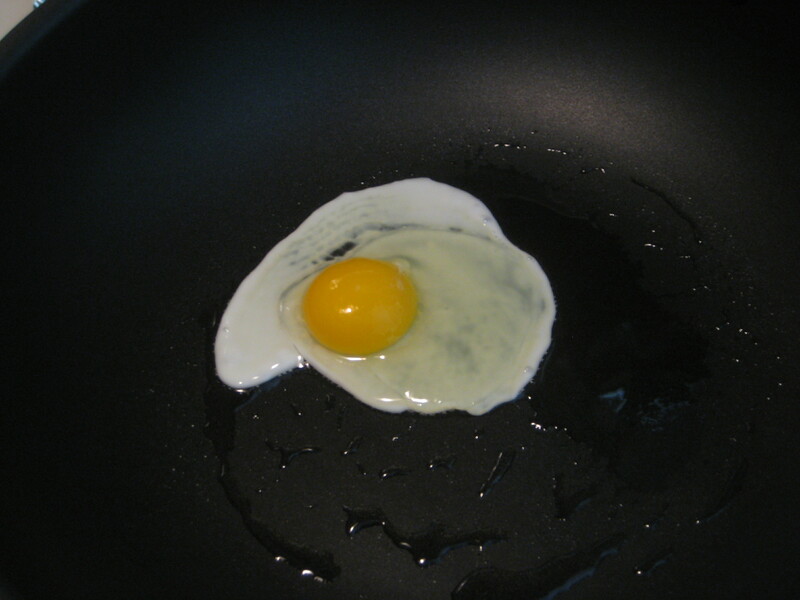 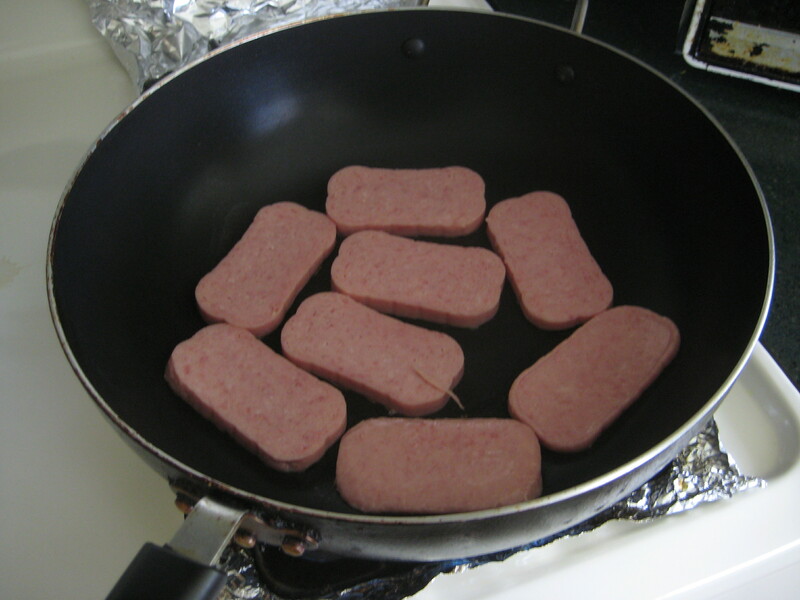 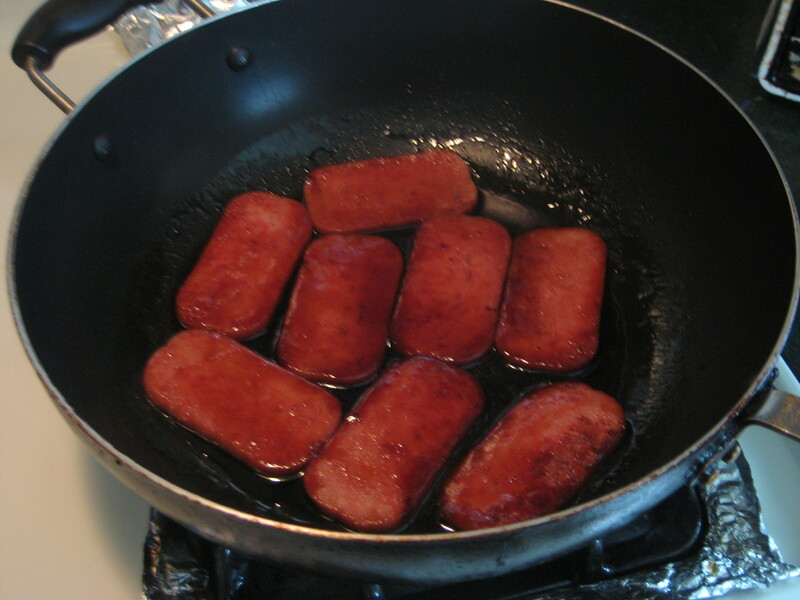 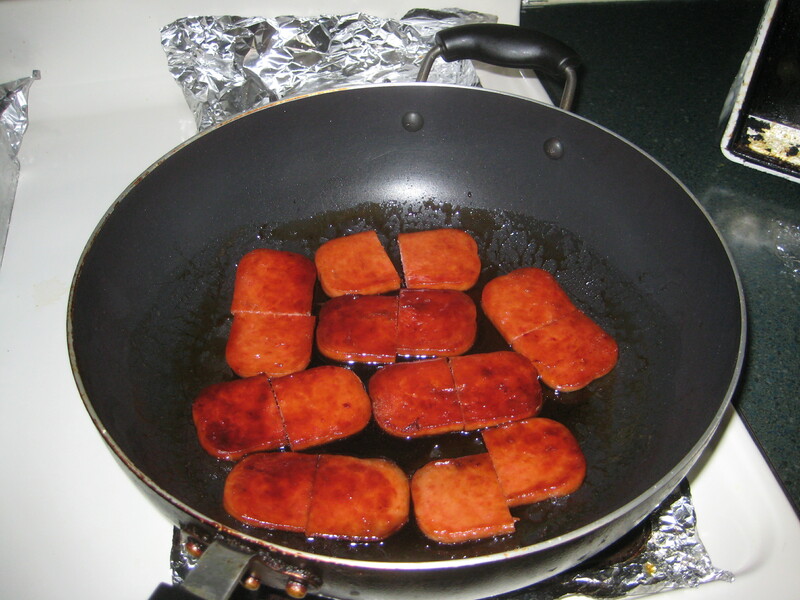 Step 4: Heat the oil in a large skillet or wok over medium-high heat. 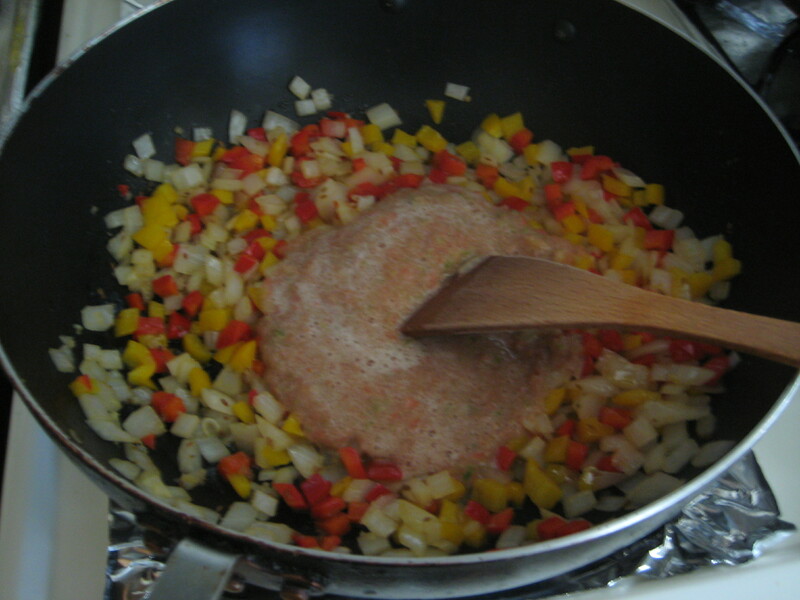 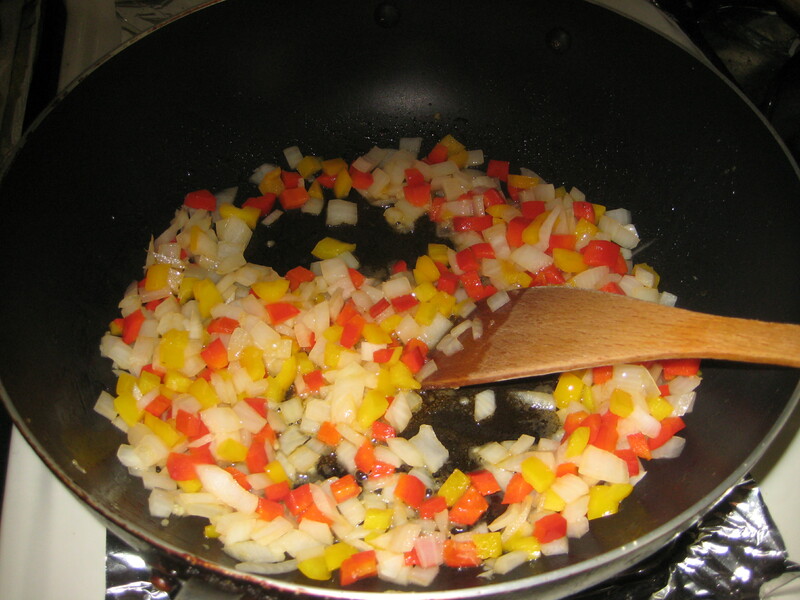 Step 5: Add the red bell pepper, onion, and garlic; cook and stir until tender, or until golden brown. 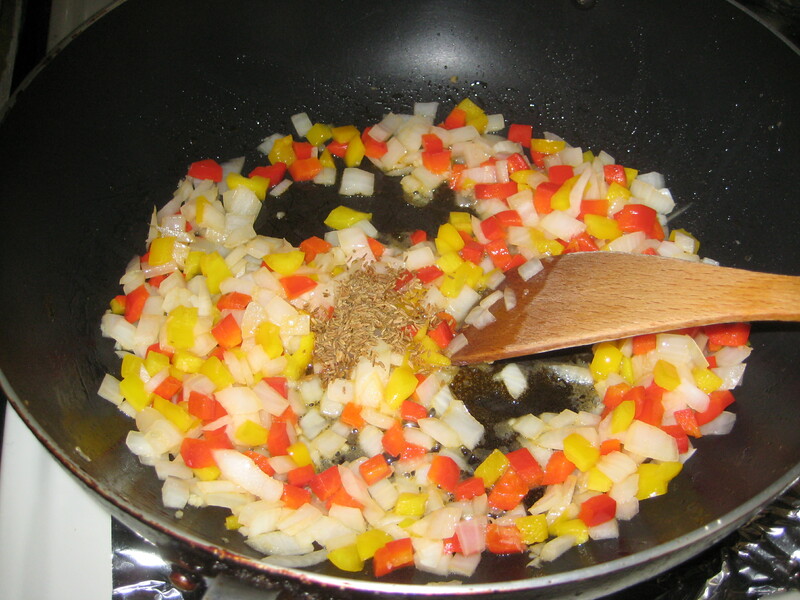 Step 6: Add the cumin seeds, and let them crackle for a few seconds and turn golden brown. 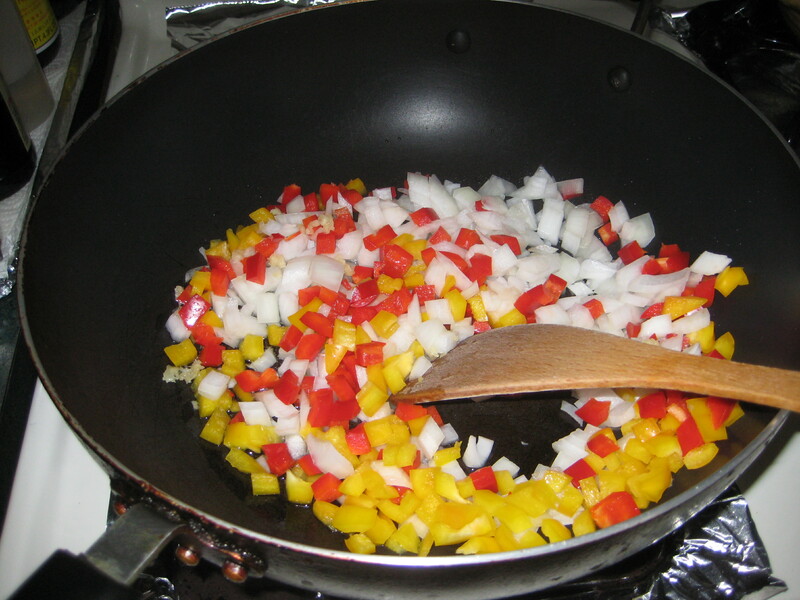 (Be careful not to burn them.) 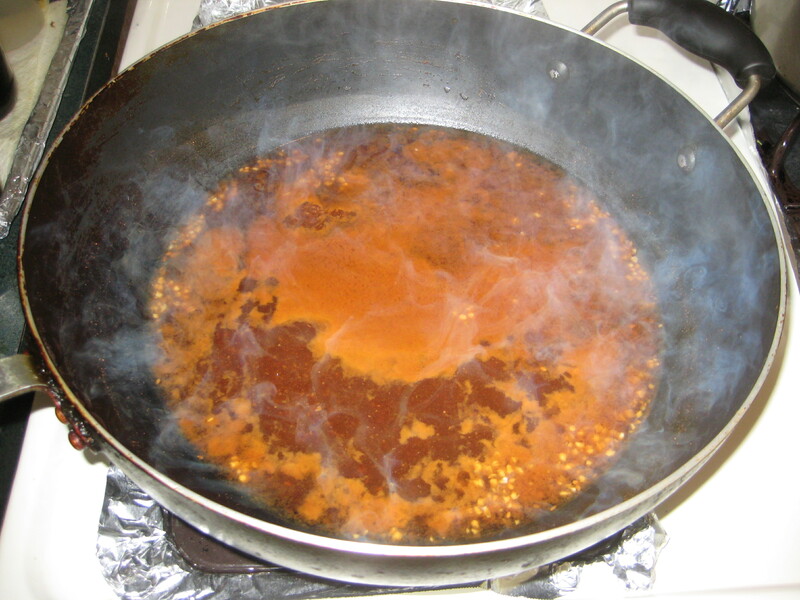 *you may want to heat a bit more oil in the pan before doing this. 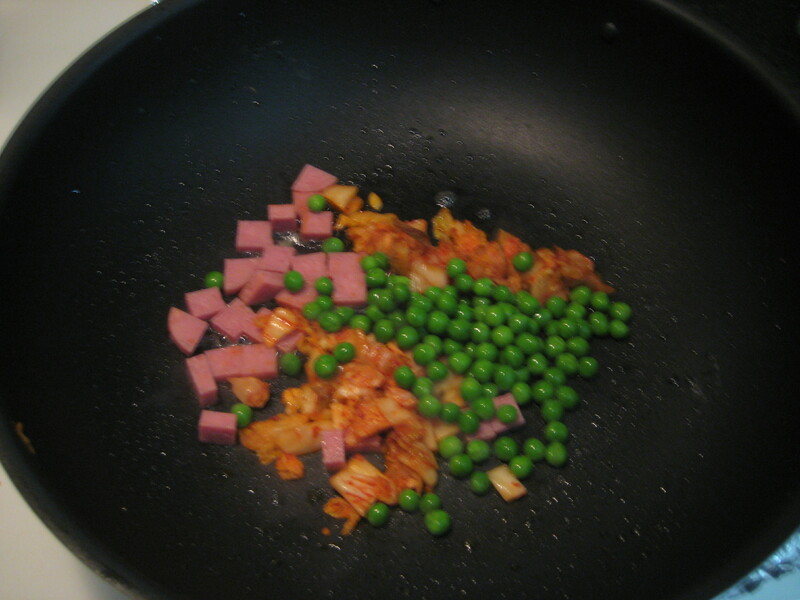 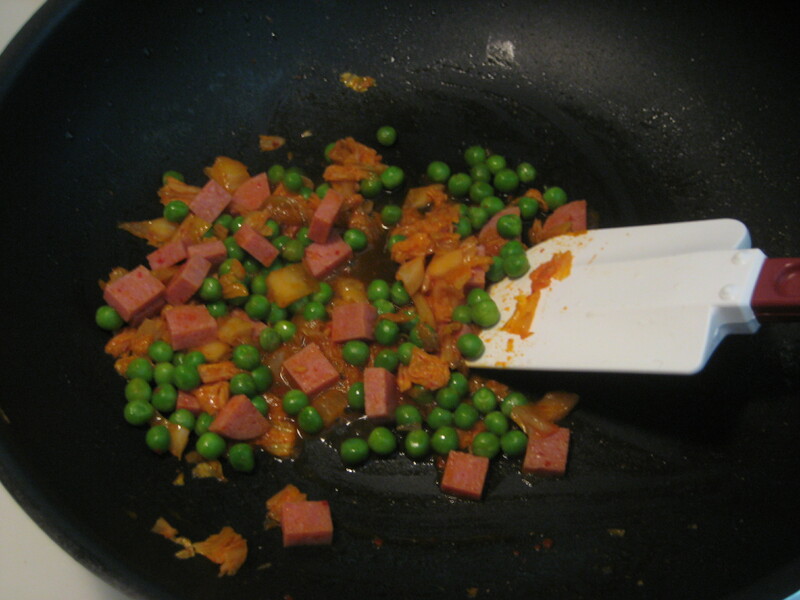 Step 7: Stir in the tomato and peas, and season with turmeric, ground coriander, cayenne pepper, and salt. 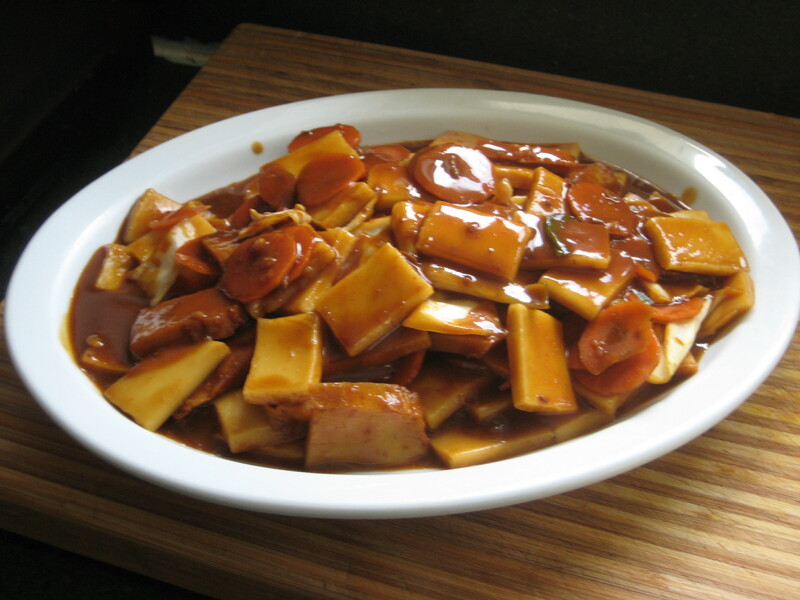 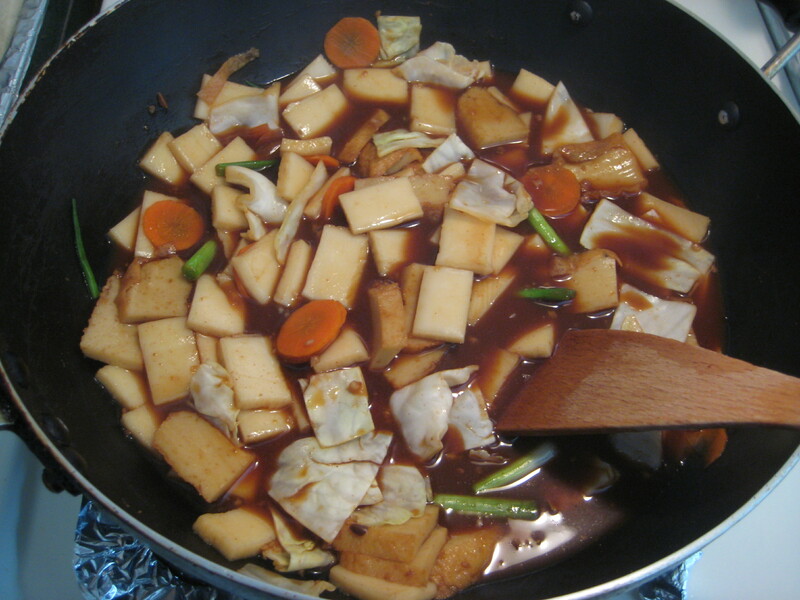 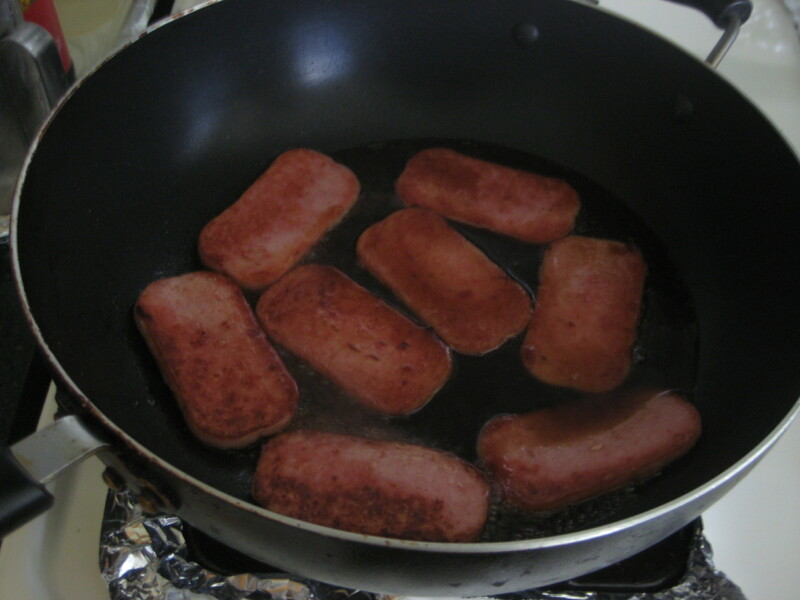 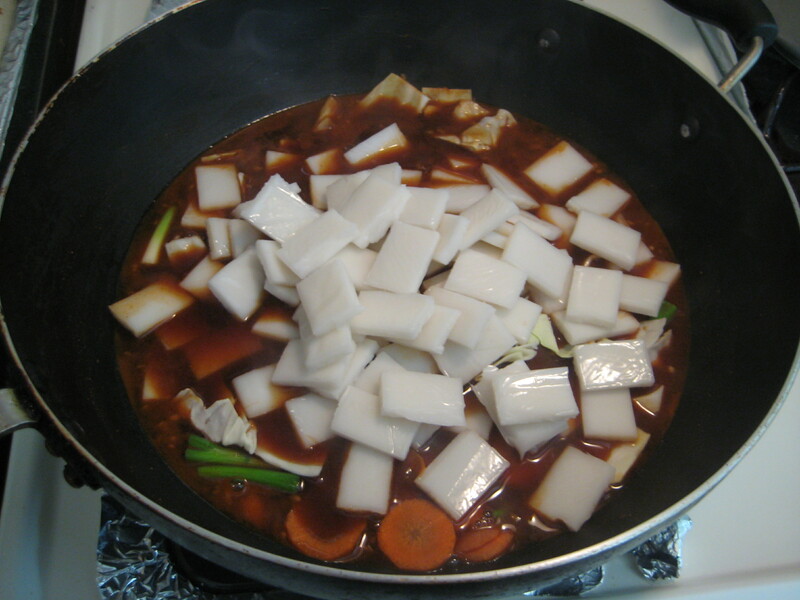 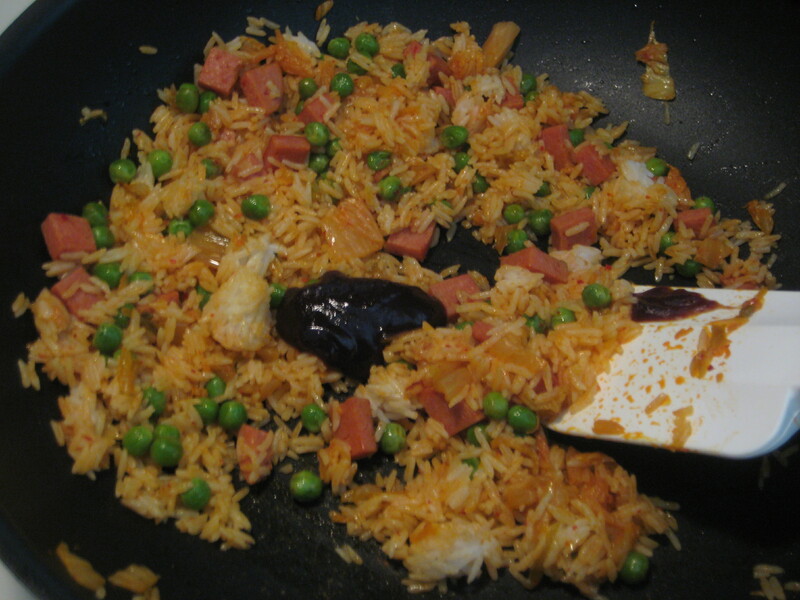 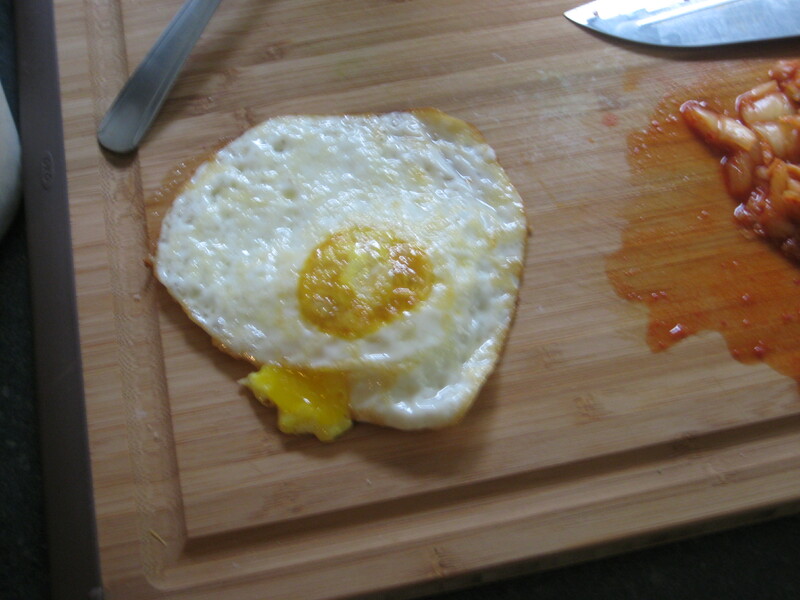 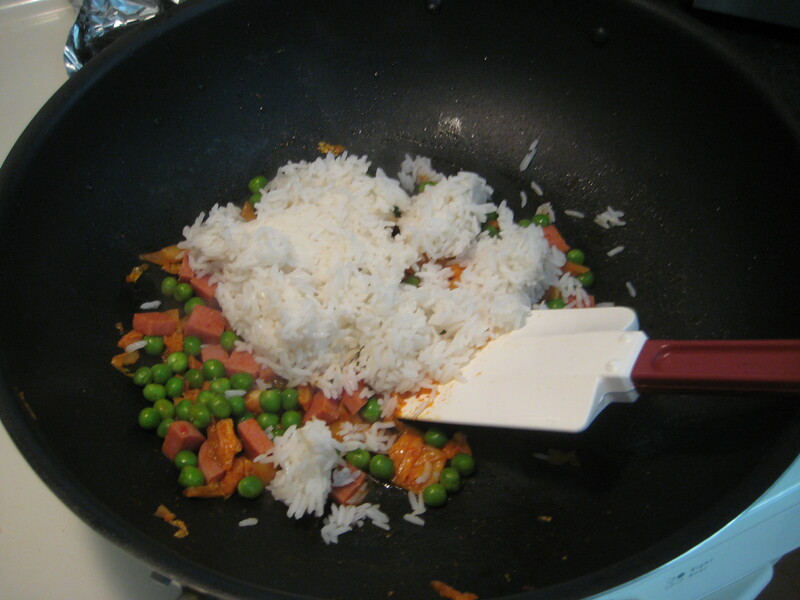 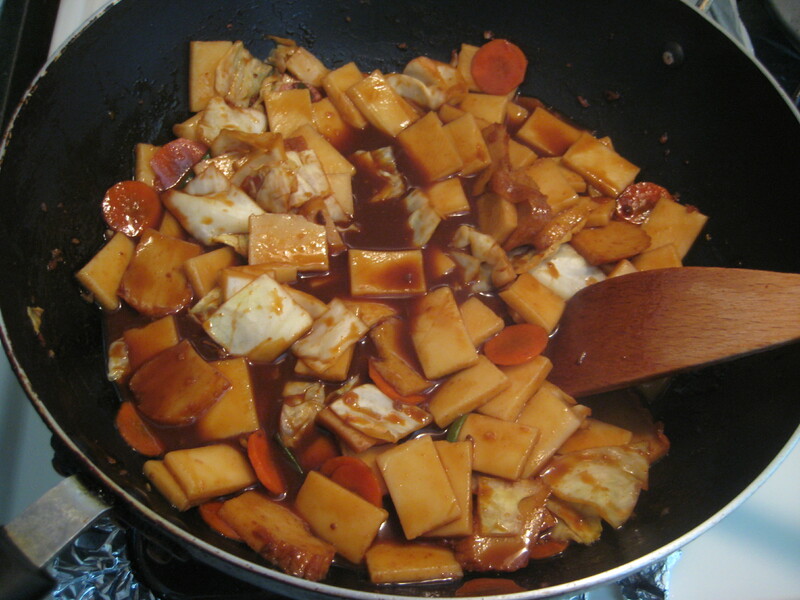 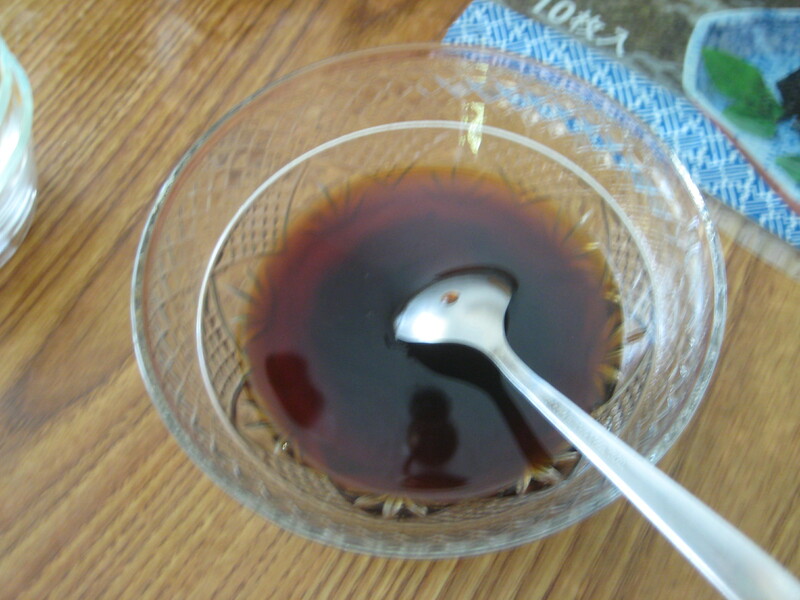 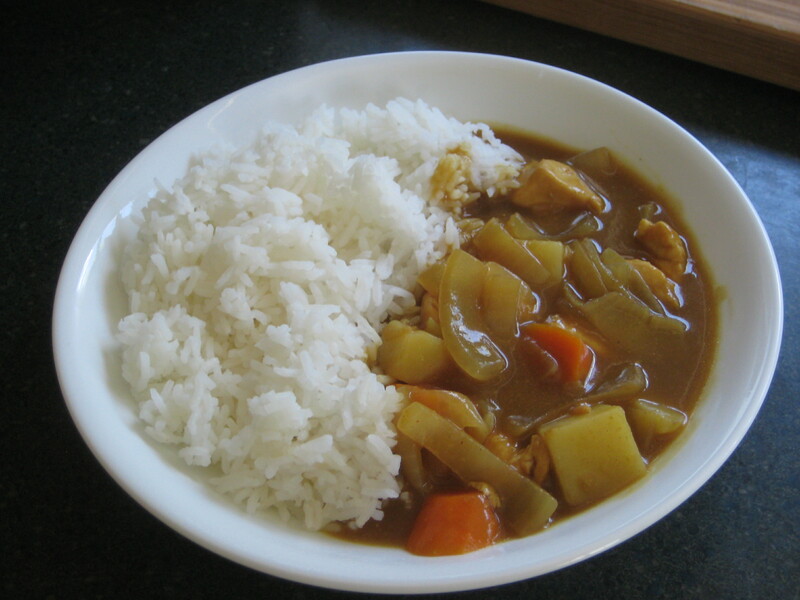 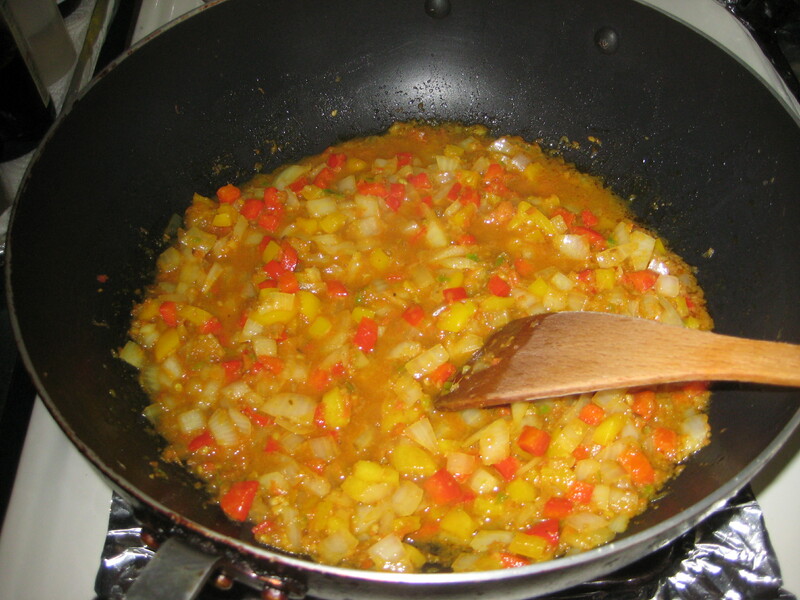 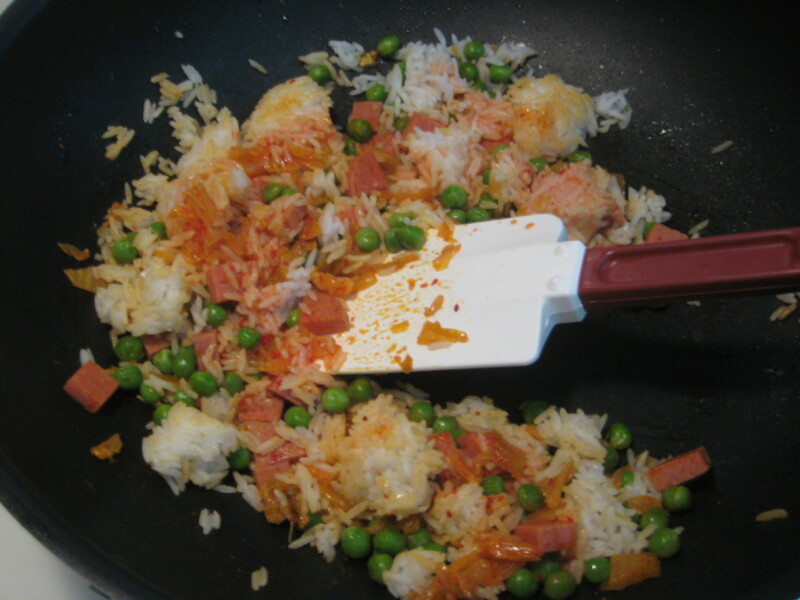 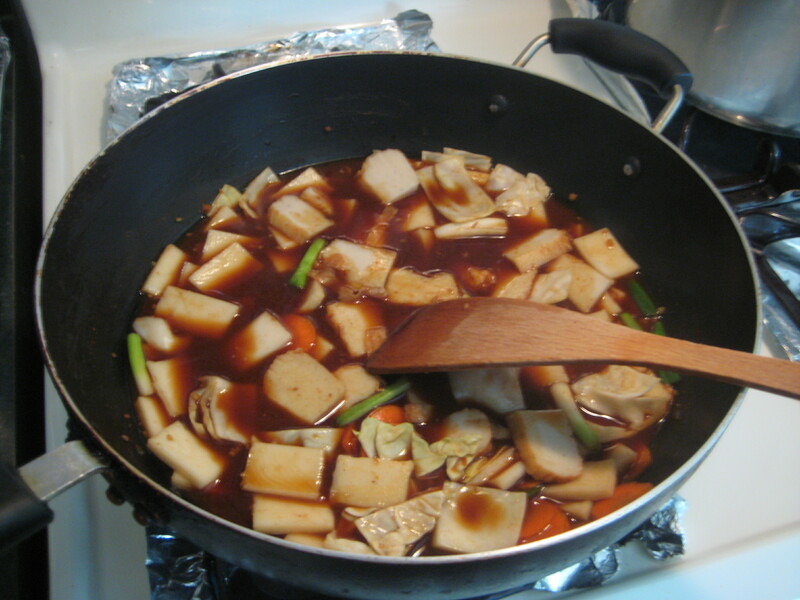 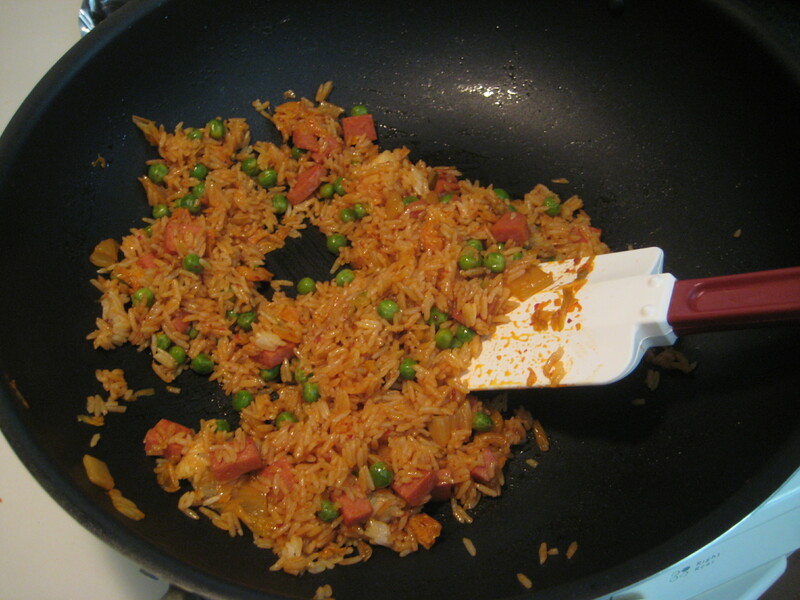 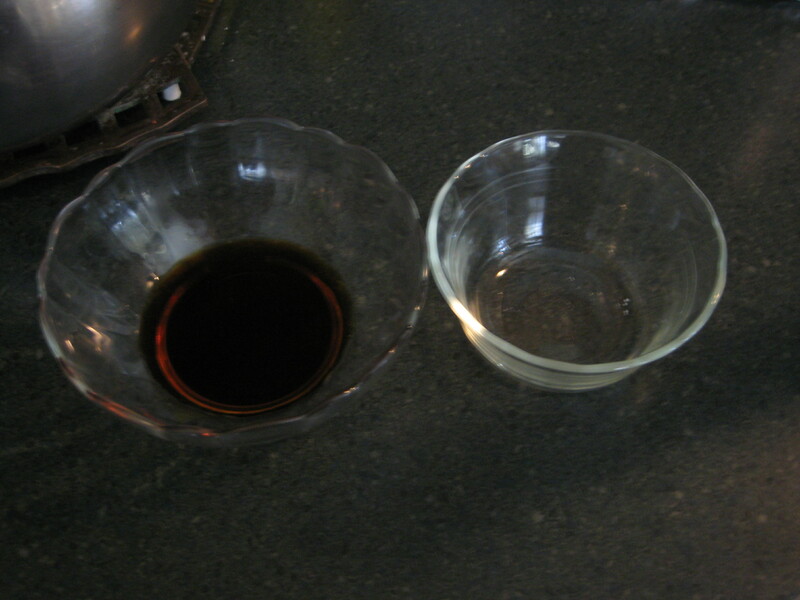 Cook and stir for a few minutes or until the tomato puree has begun to separate from the oil. 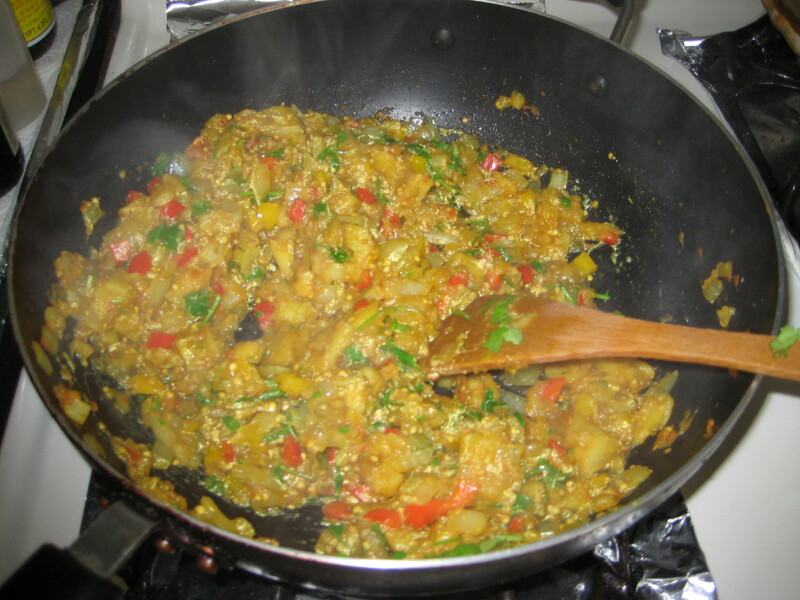 Step 8: Add eggplant over medium heat, keep stirring the eggplant and mashing the eggplant as it cooks; 8-10 minutes. 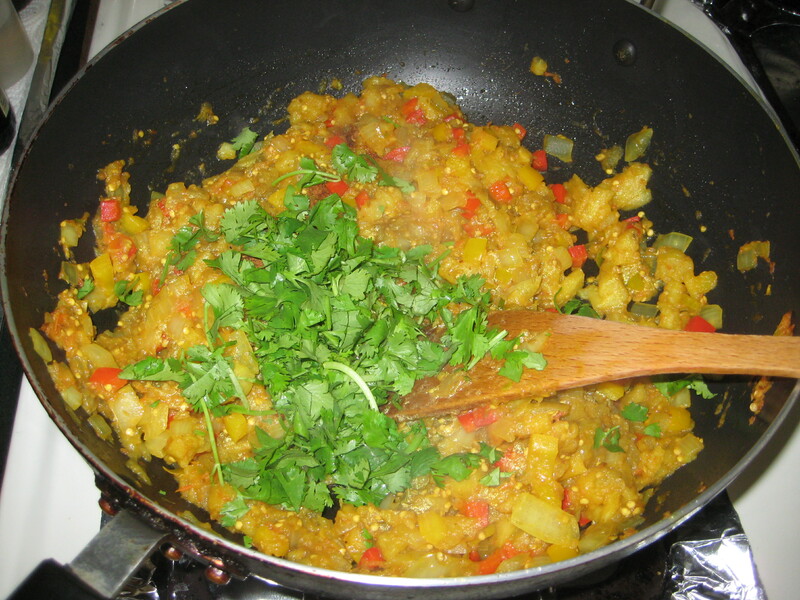 Step 9: Add the garam masala and cilantro.